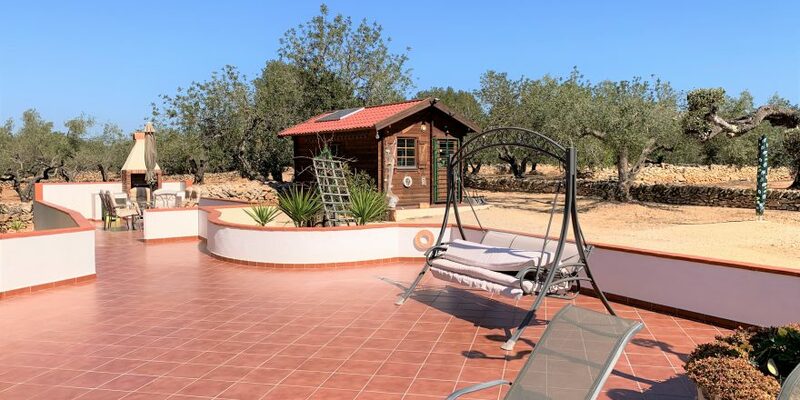 Once again we have been trusted with another exclusive property on our books and it is lovely. 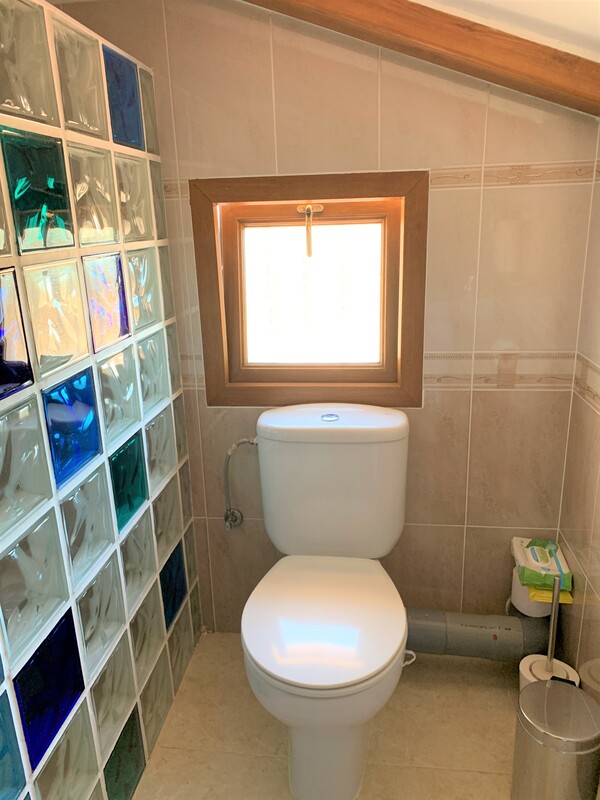 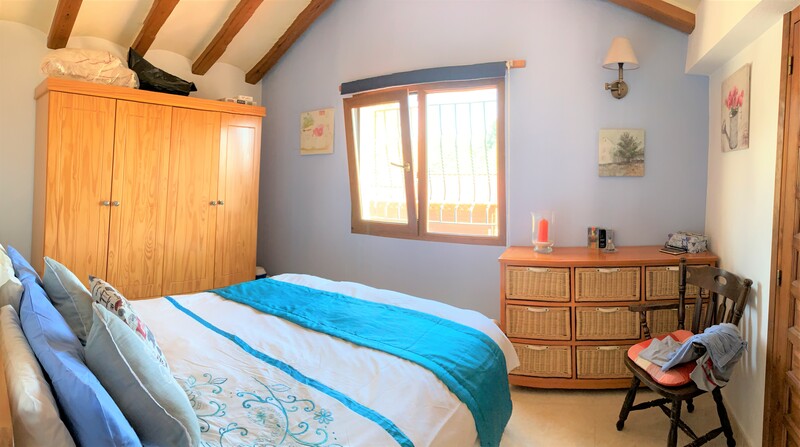 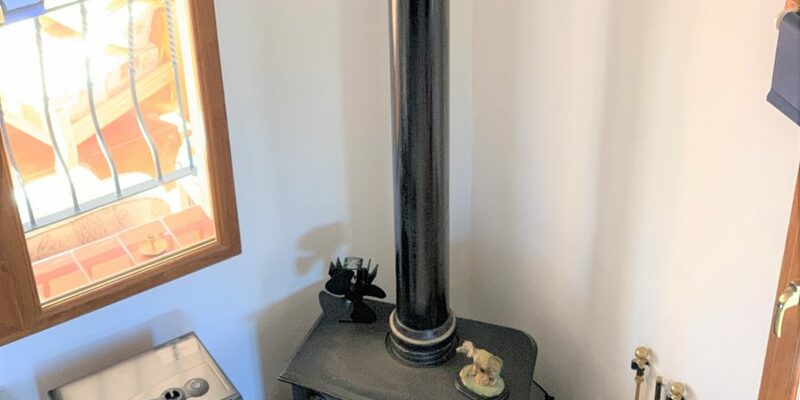 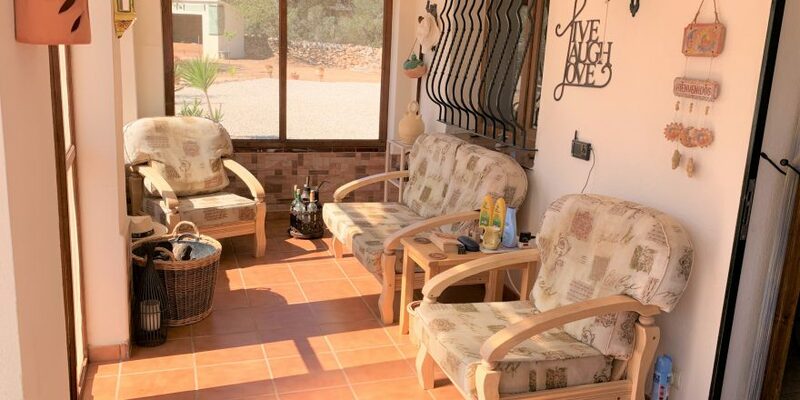 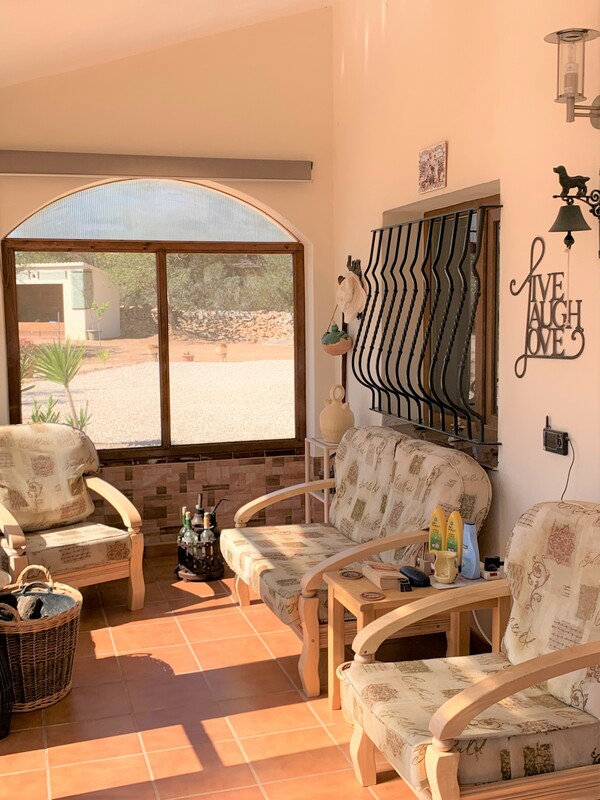 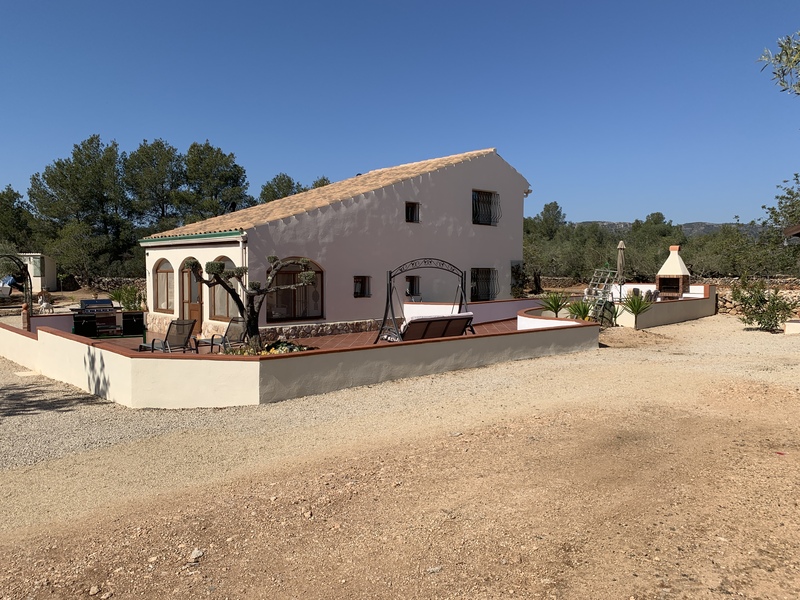 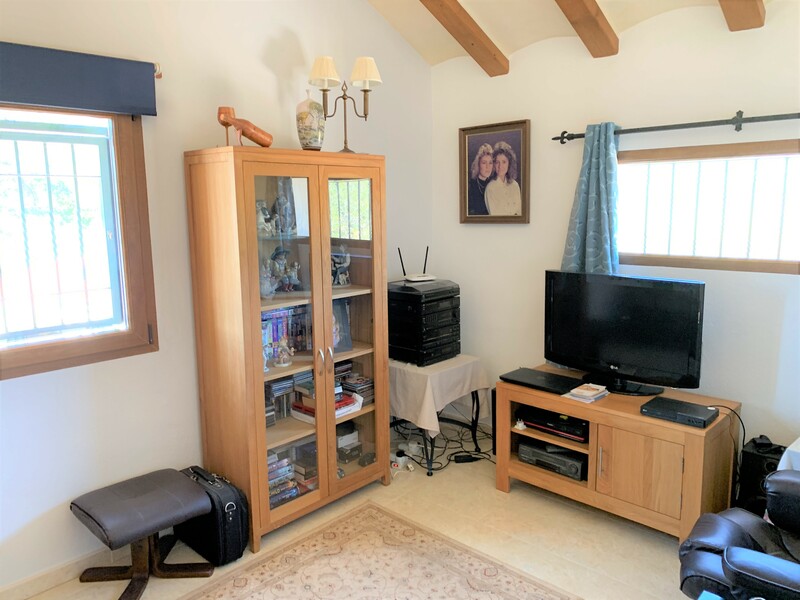 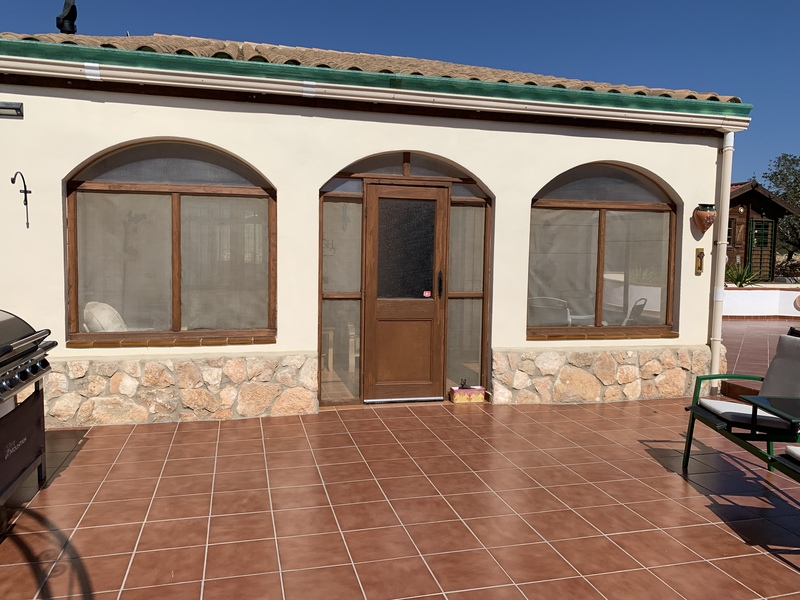 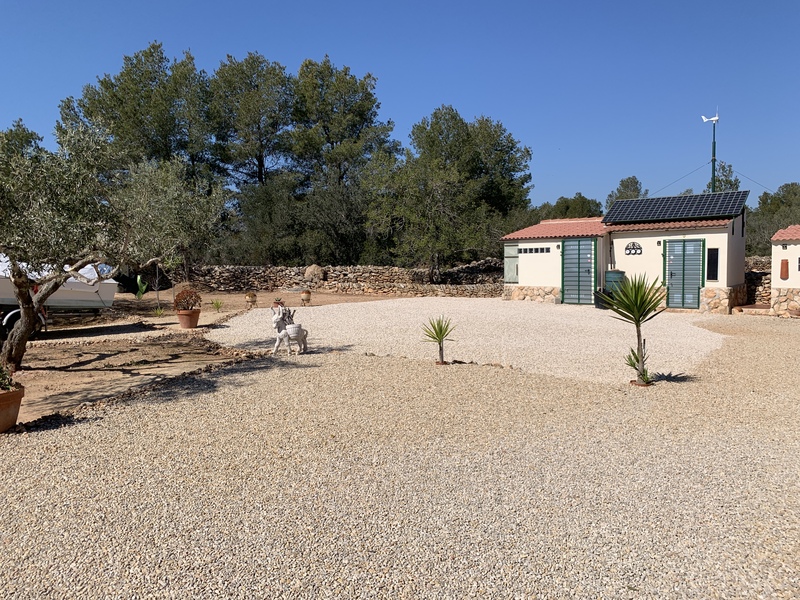 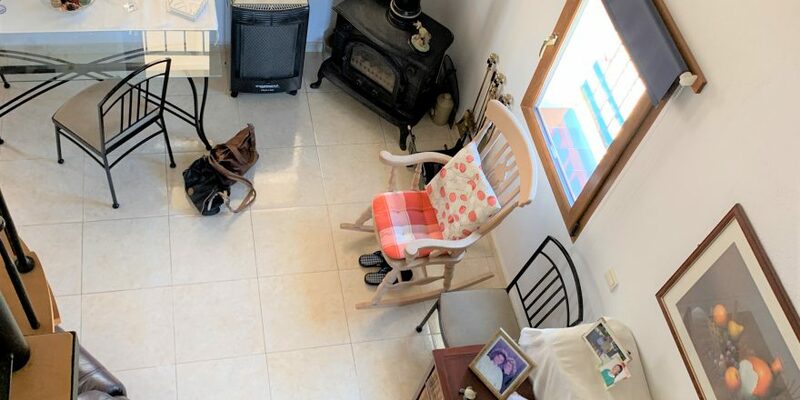 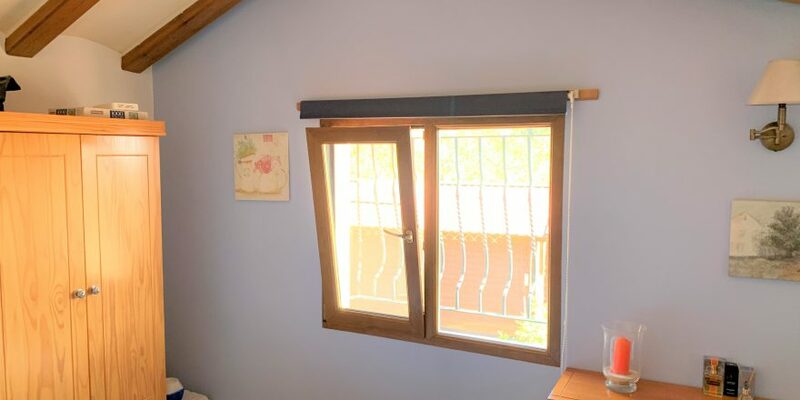 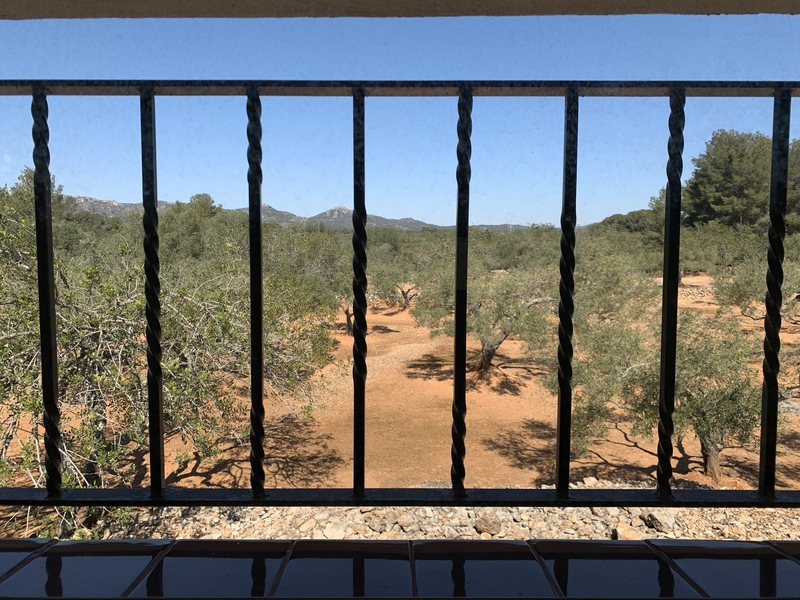 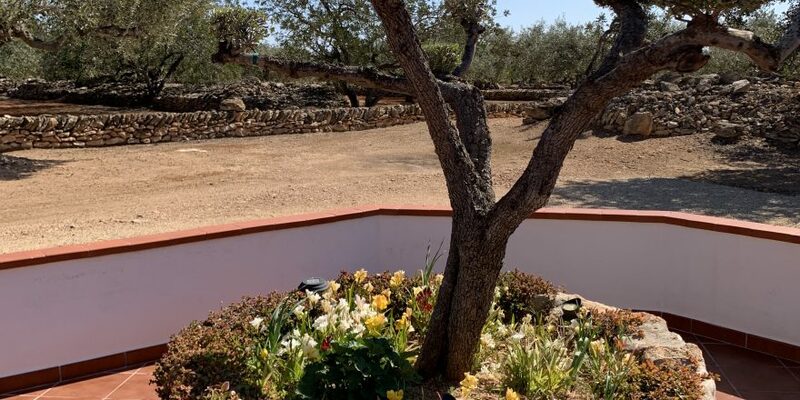 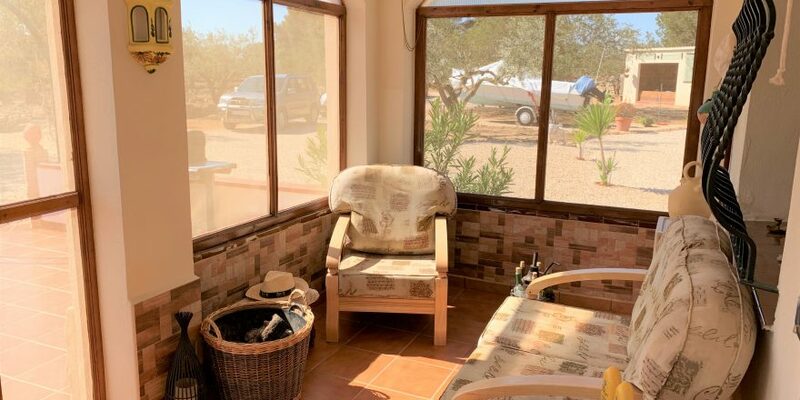 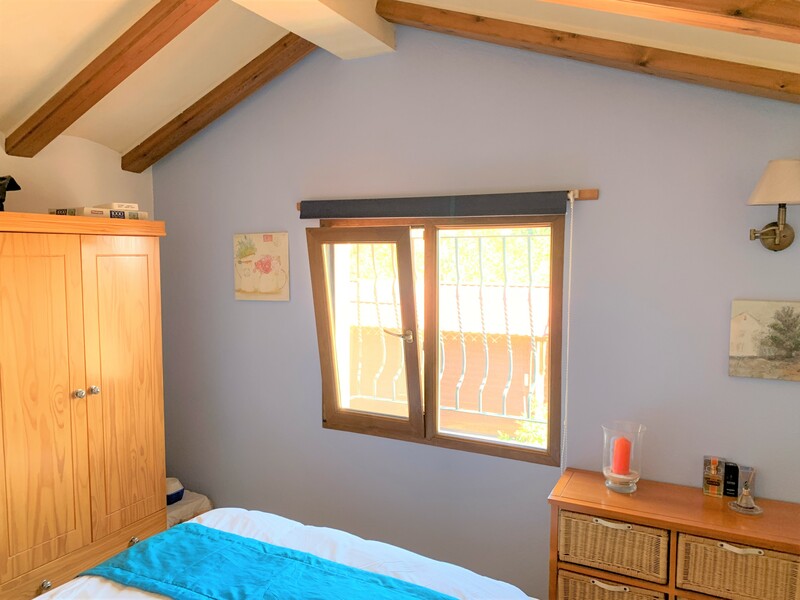 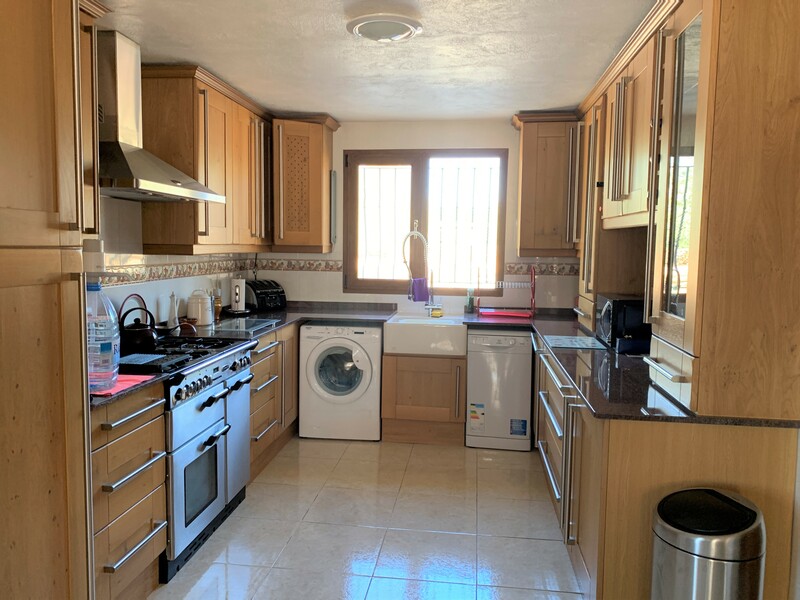 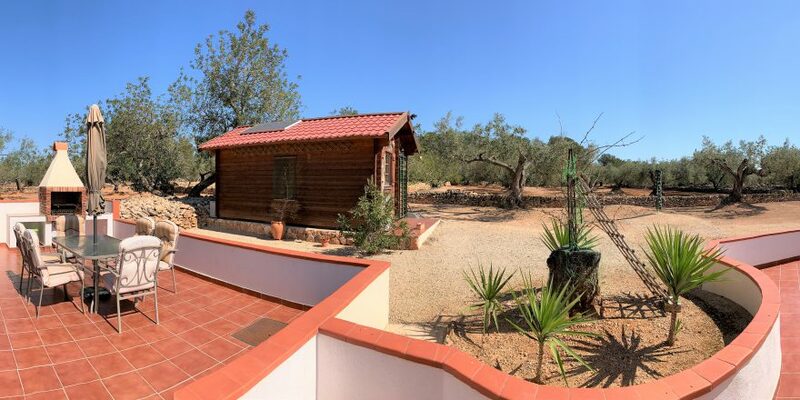 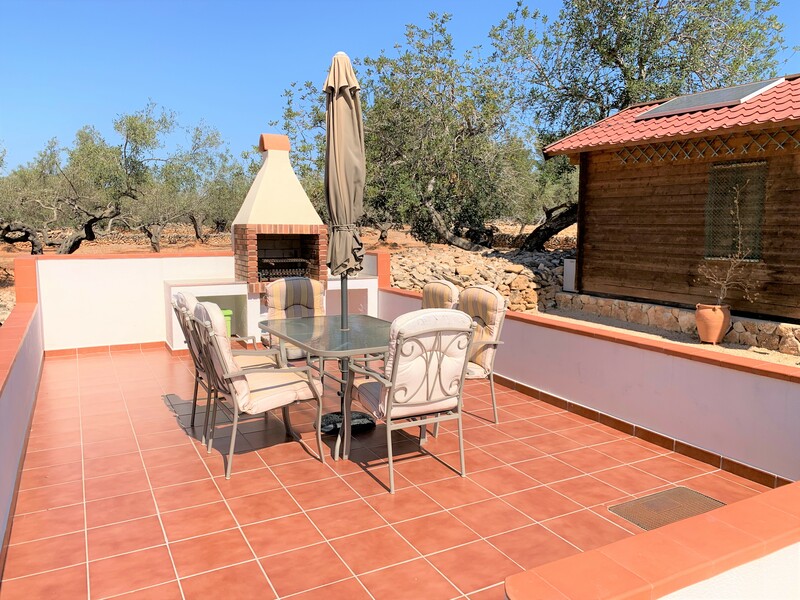 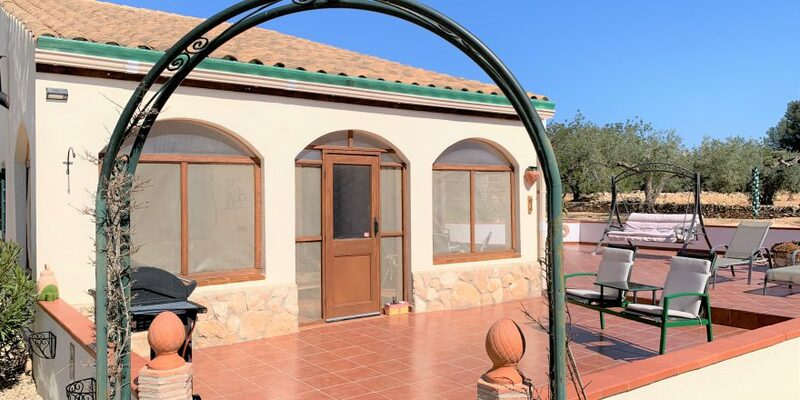 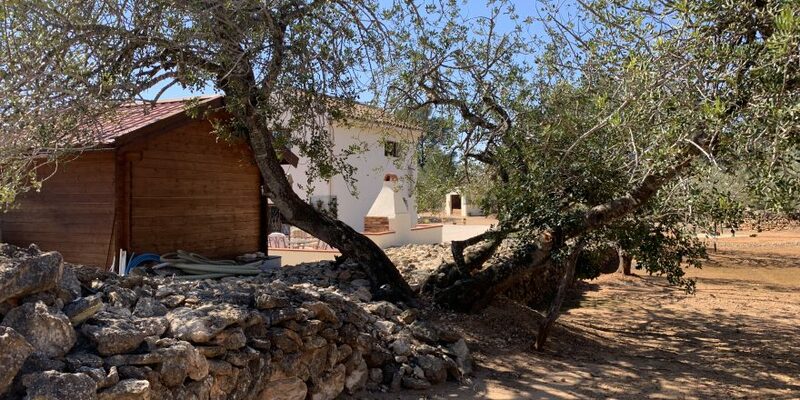 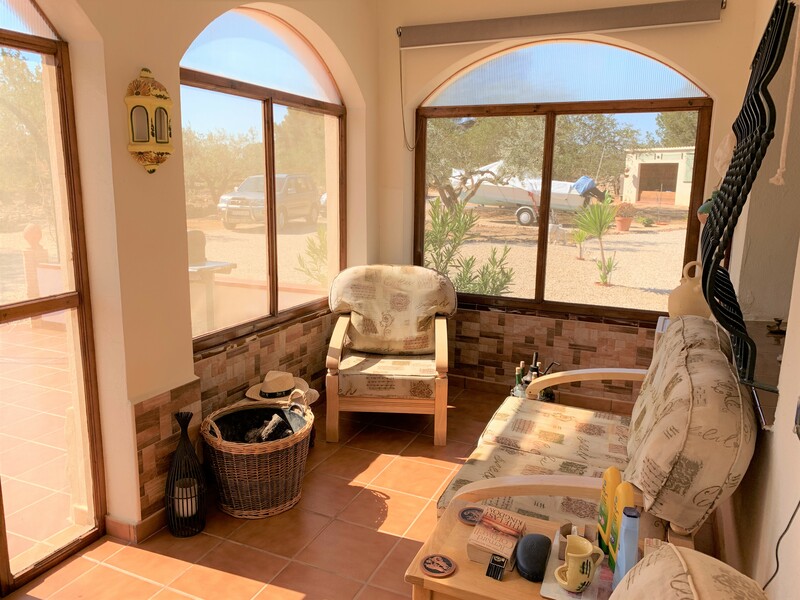 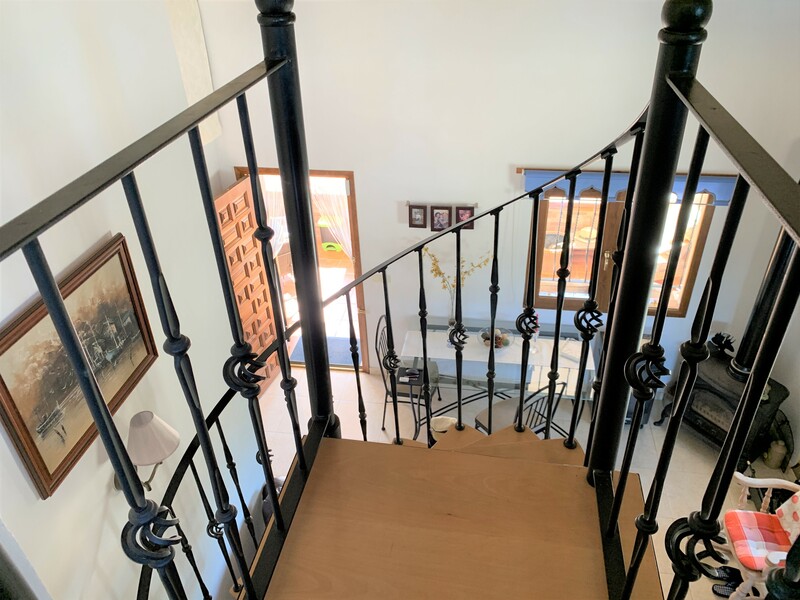 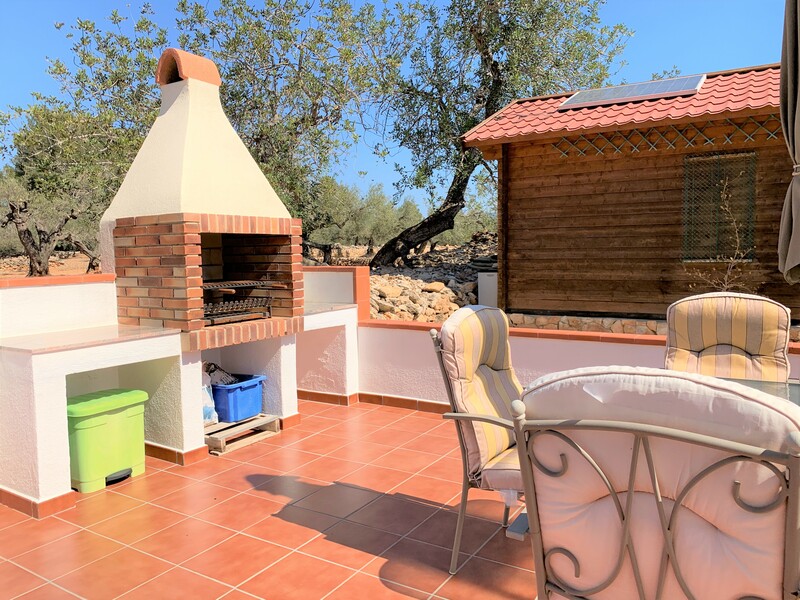 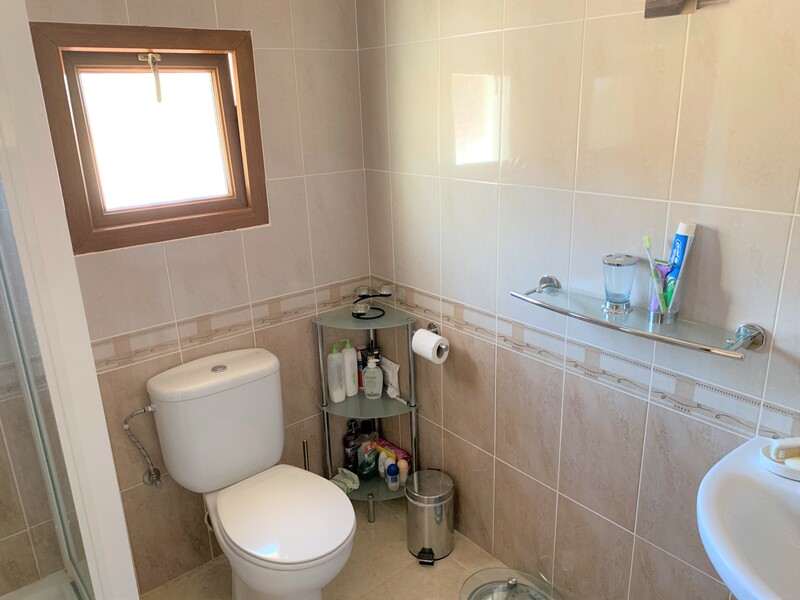 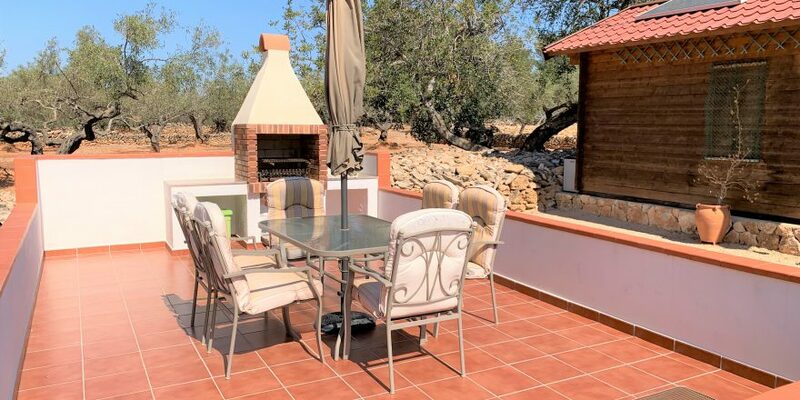 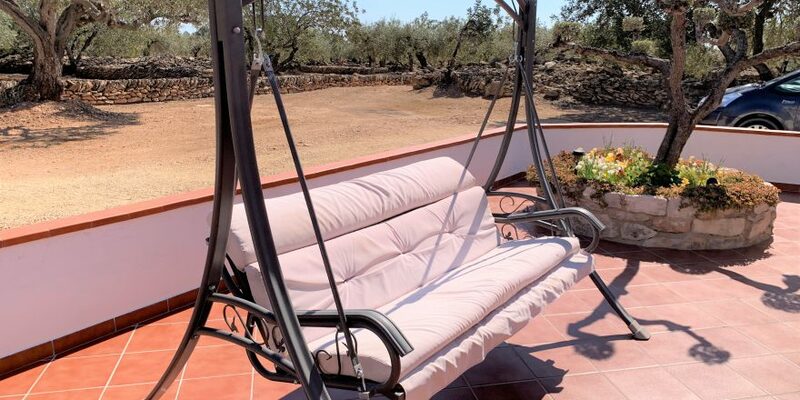 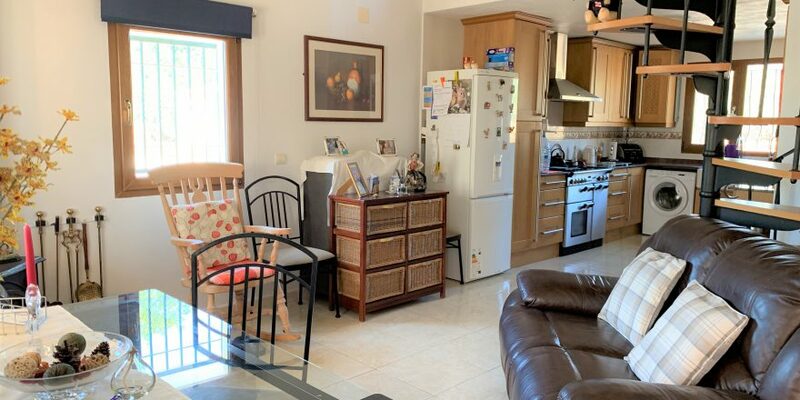 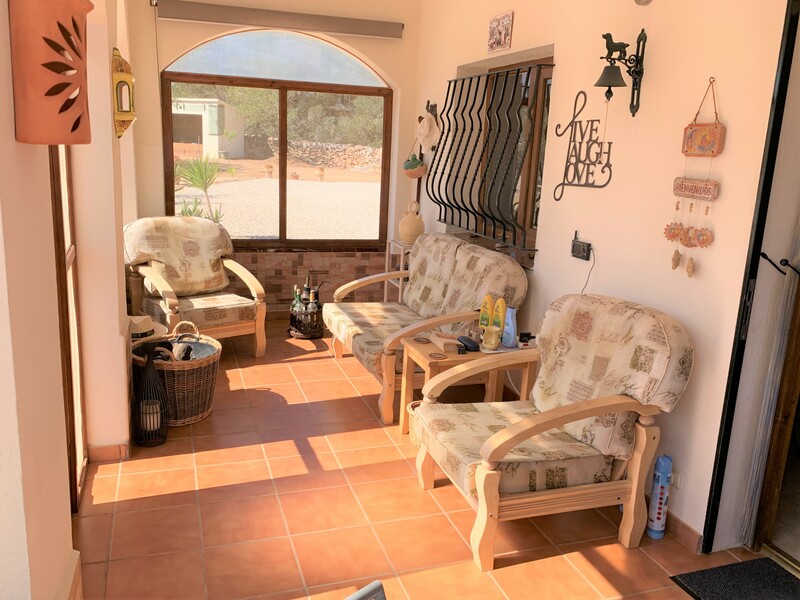 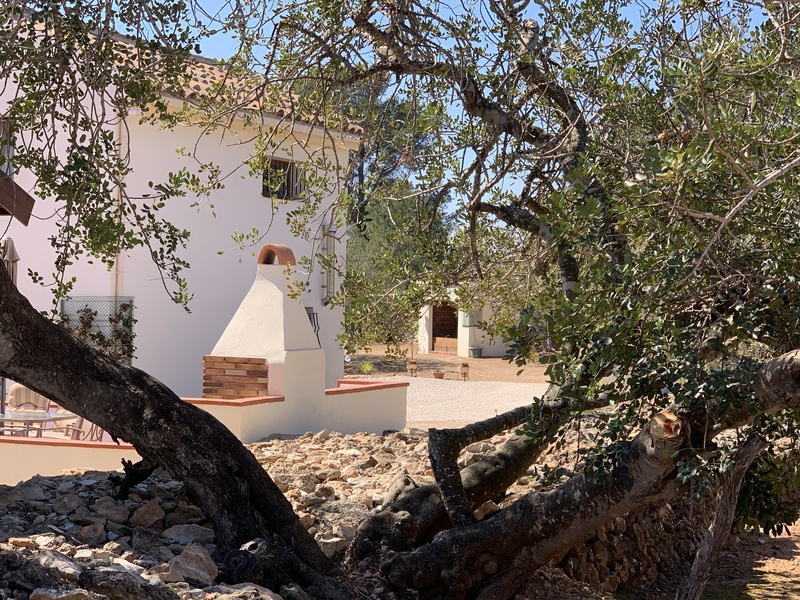 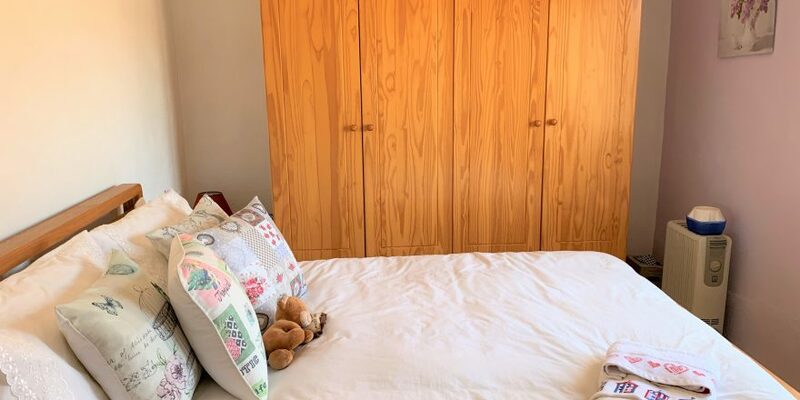 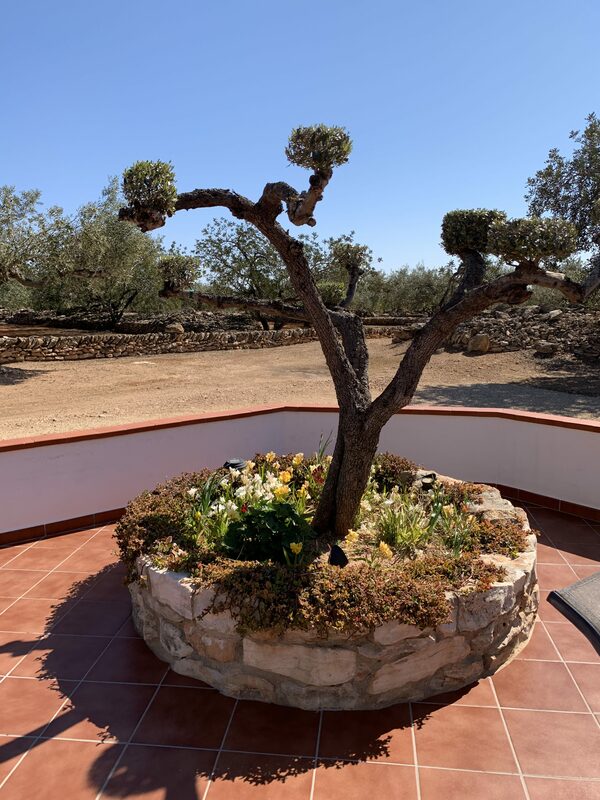 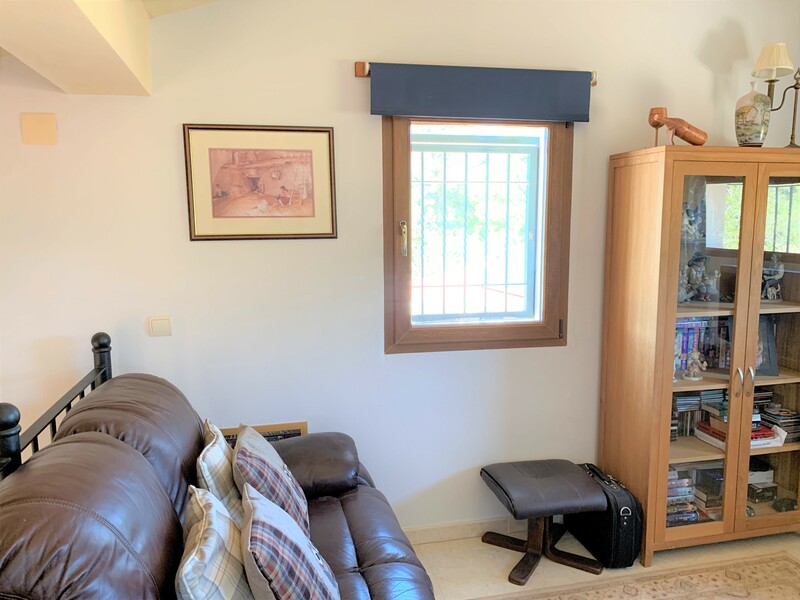 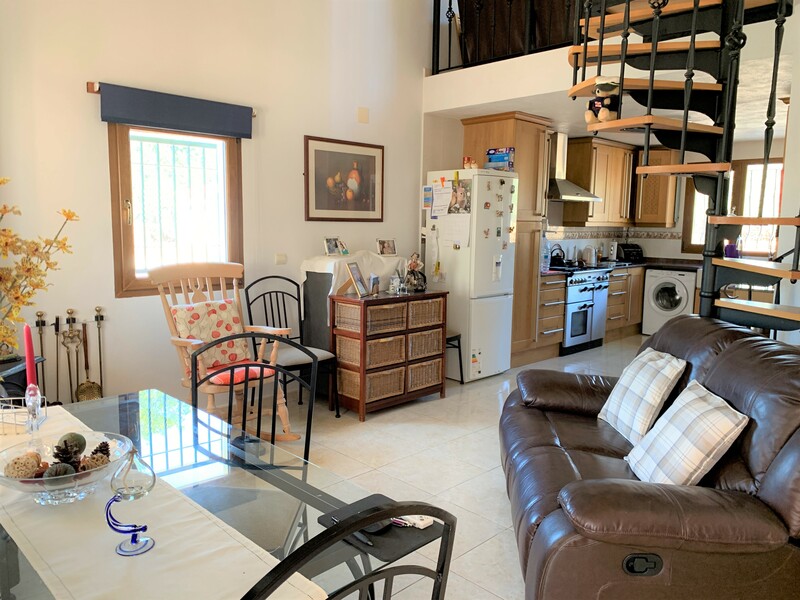 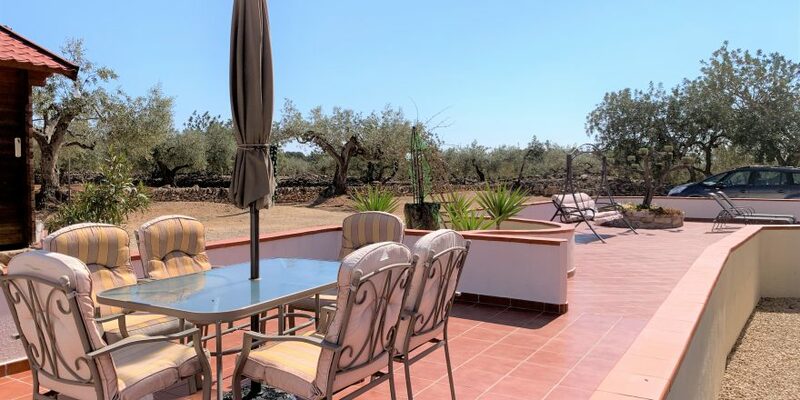 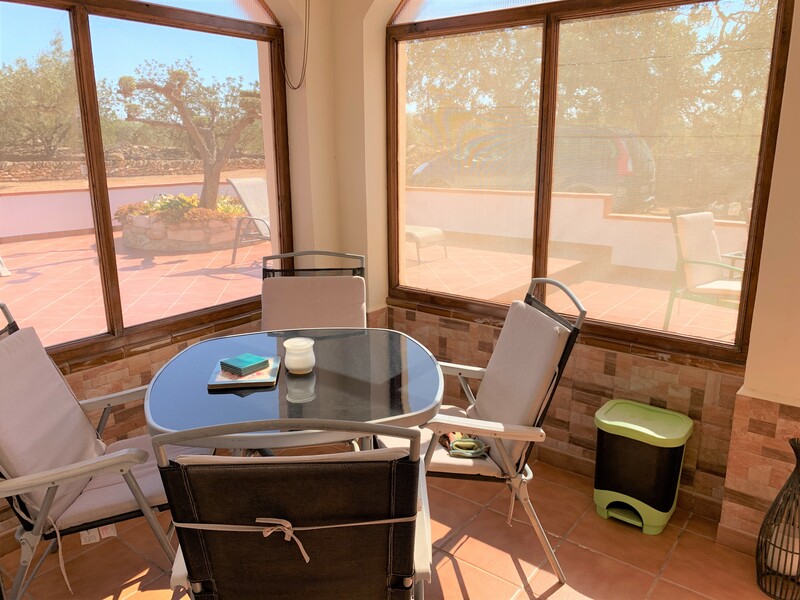 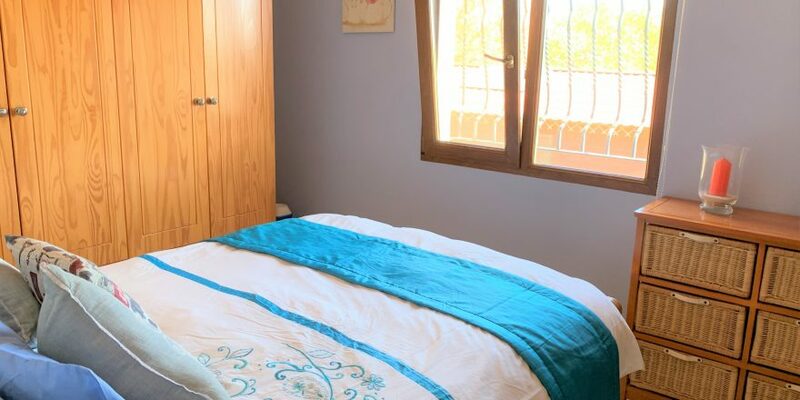 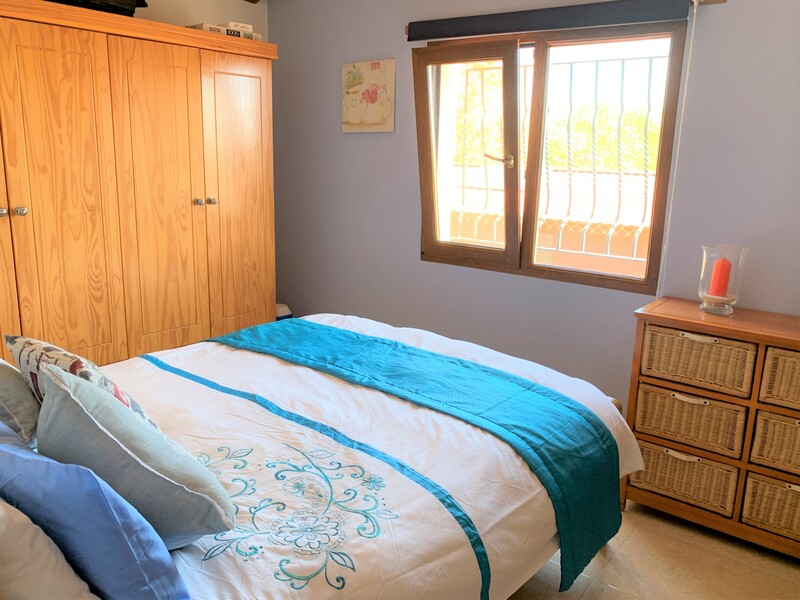 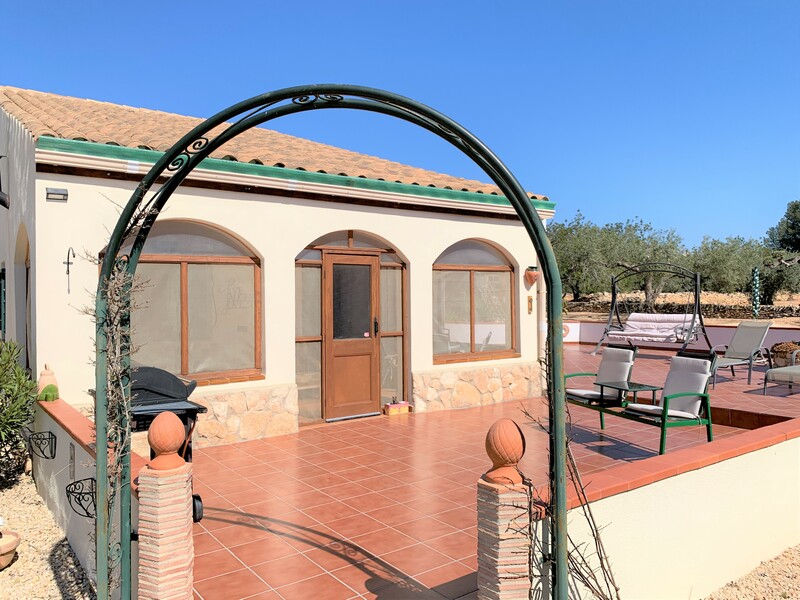 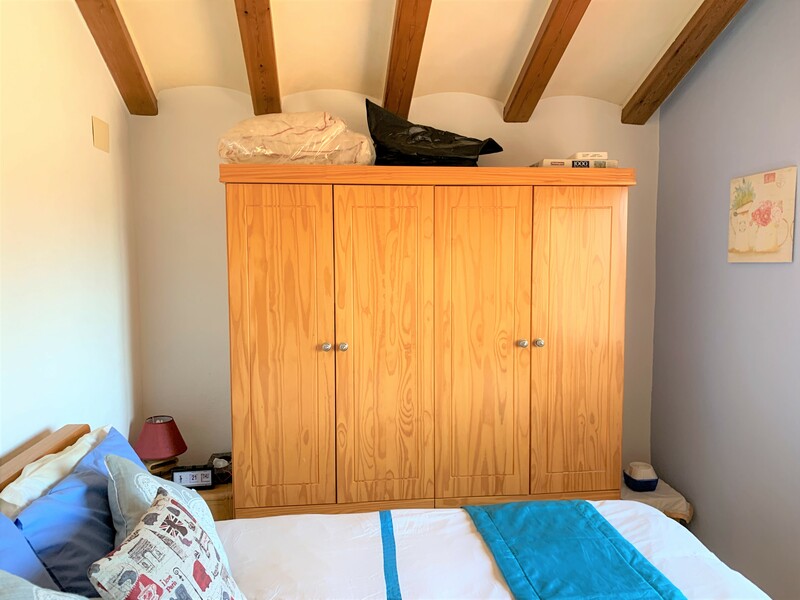 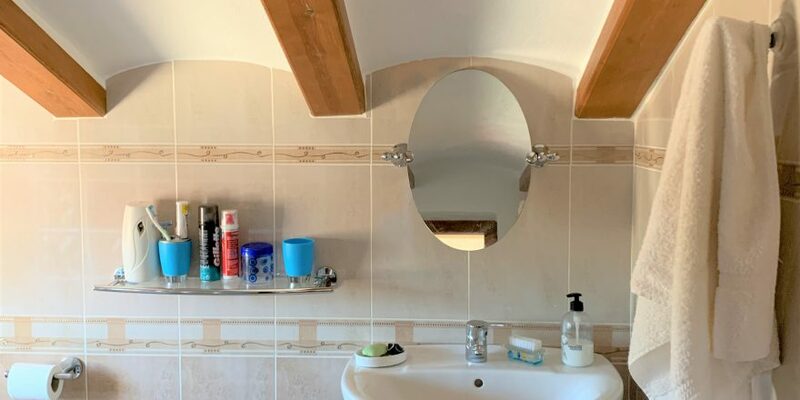 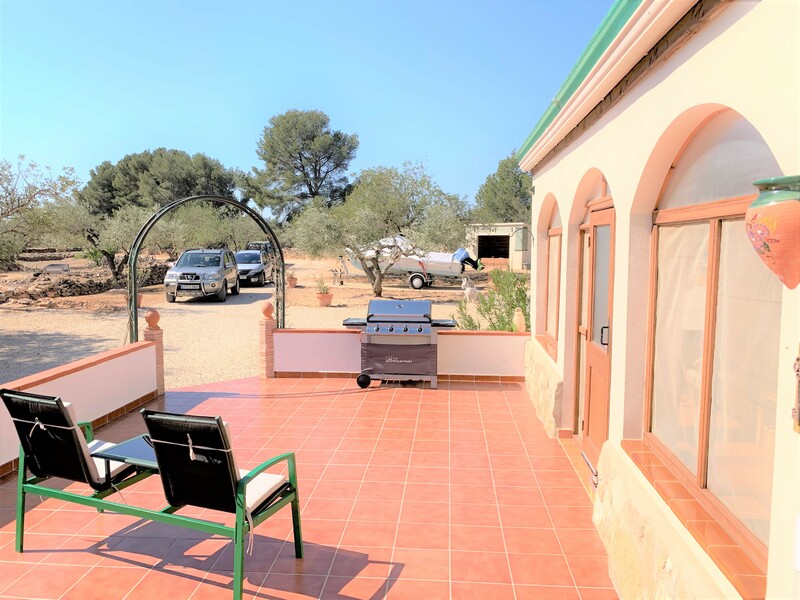 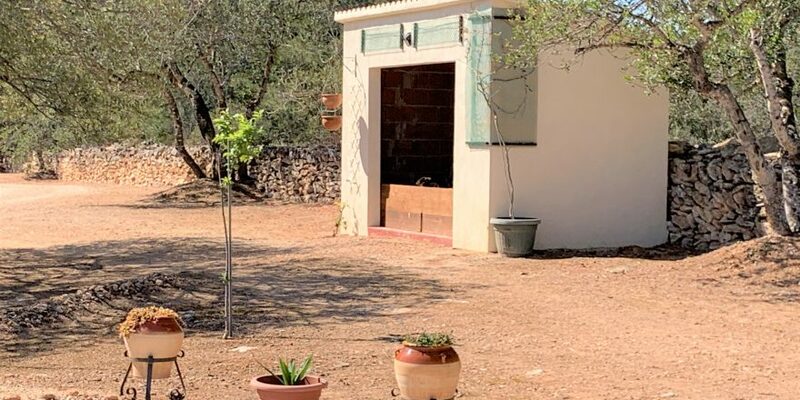 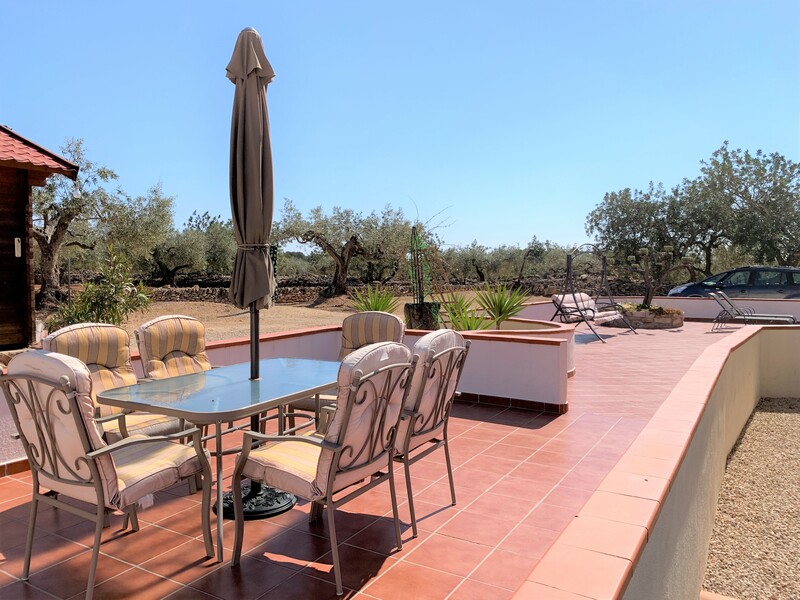 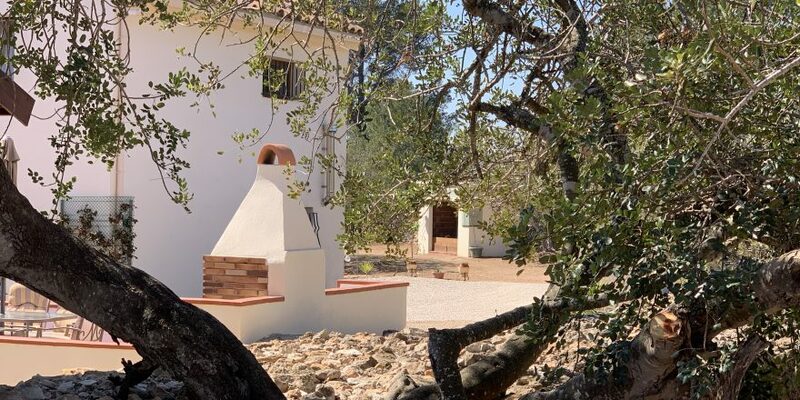 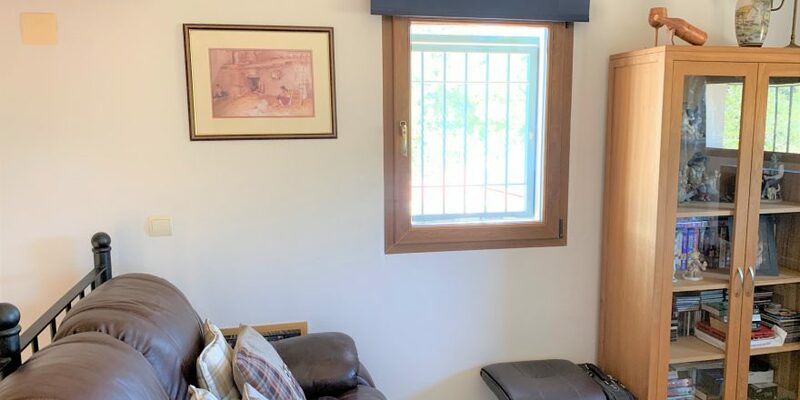 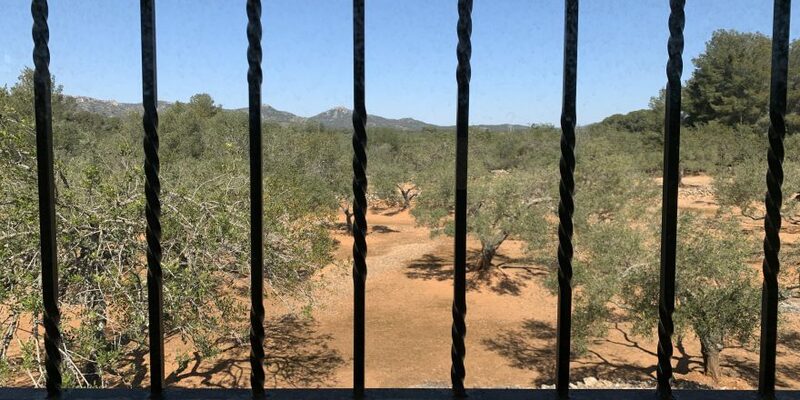 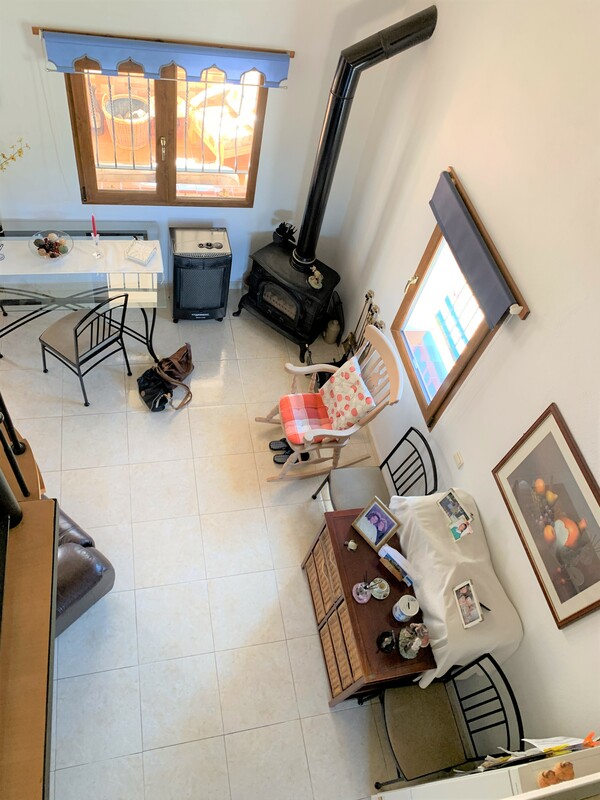 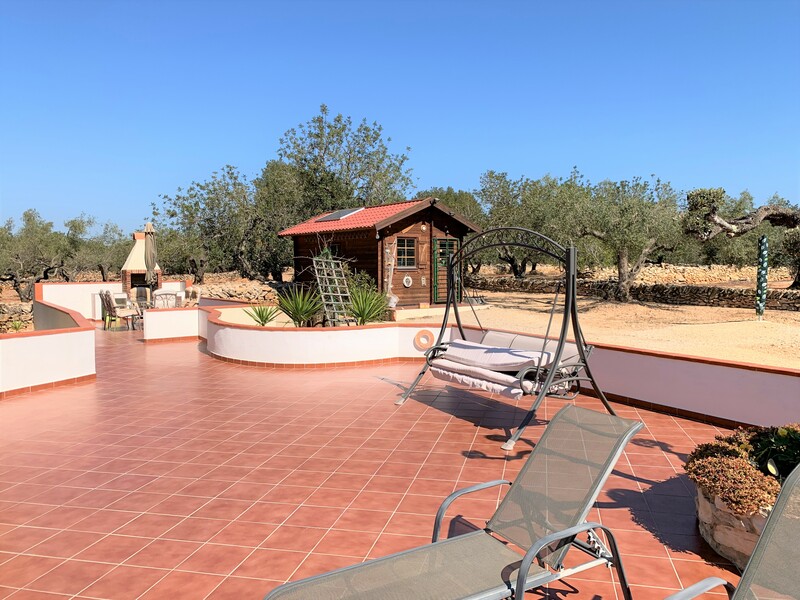 Tucked away in the countryside towards the mountains you will find this beautifully renovated 2 bedroomed finca in 1 hectare of fenced, clean land. 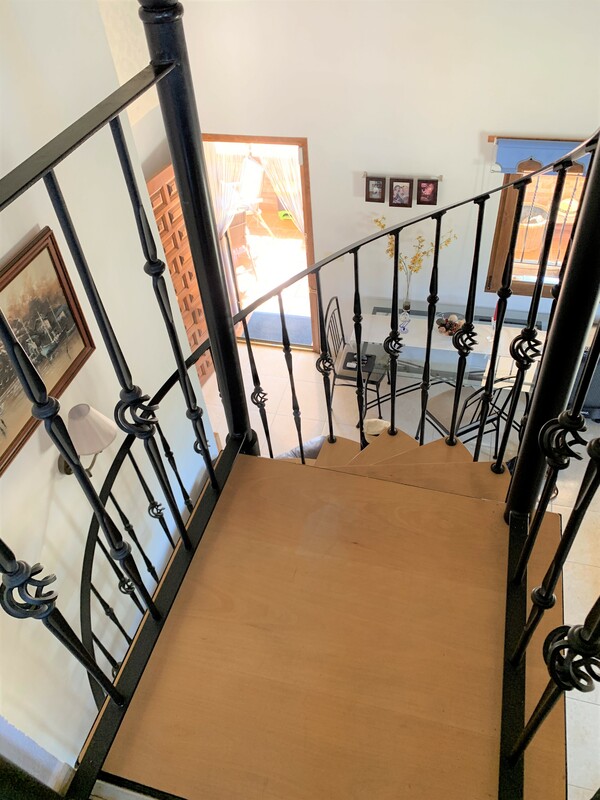 Everything that is built here is of high quality. 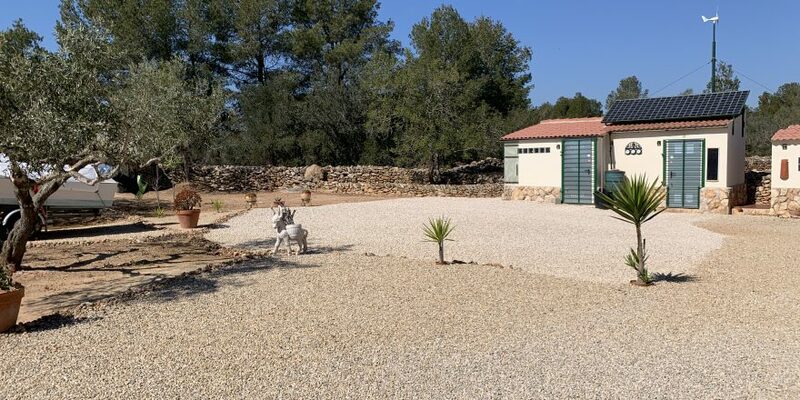 You approach the property off a very good tarmac road and through some iron gates which lead you up a driveway to the property. 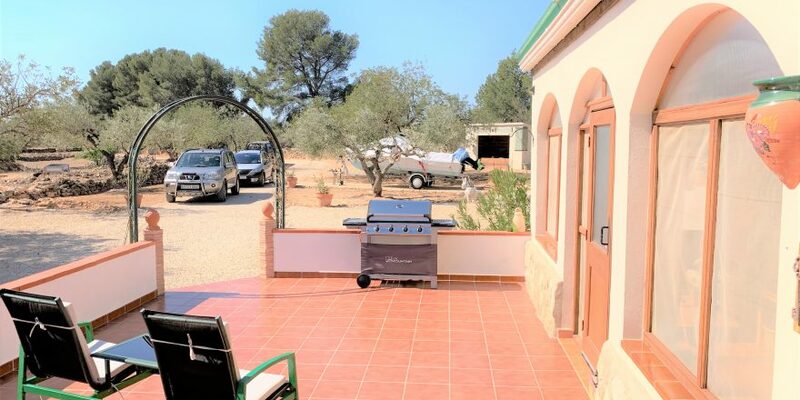 There is ample parking space for many vehicles. 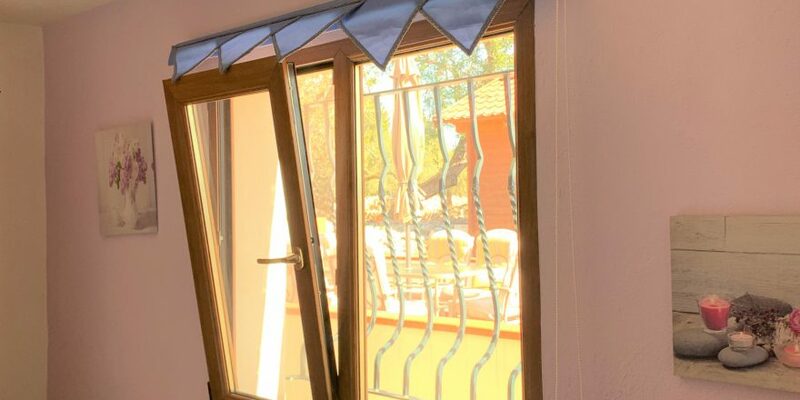 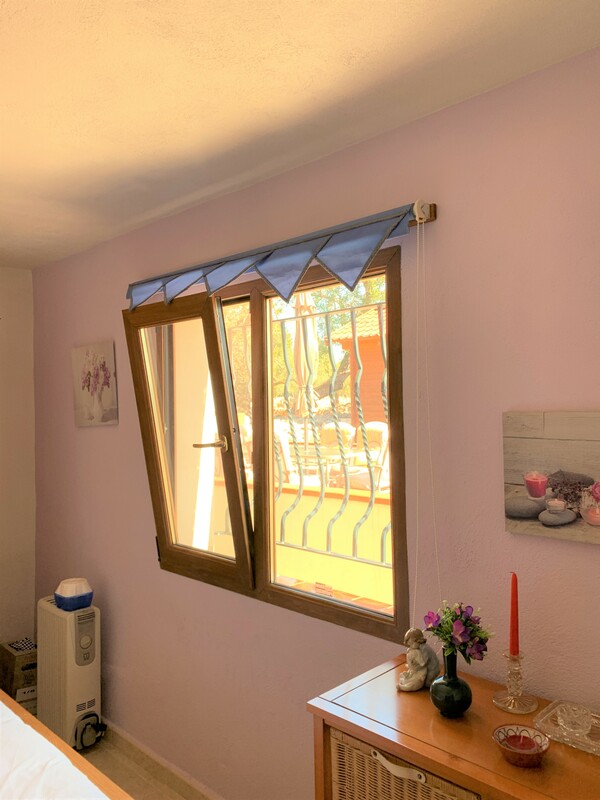 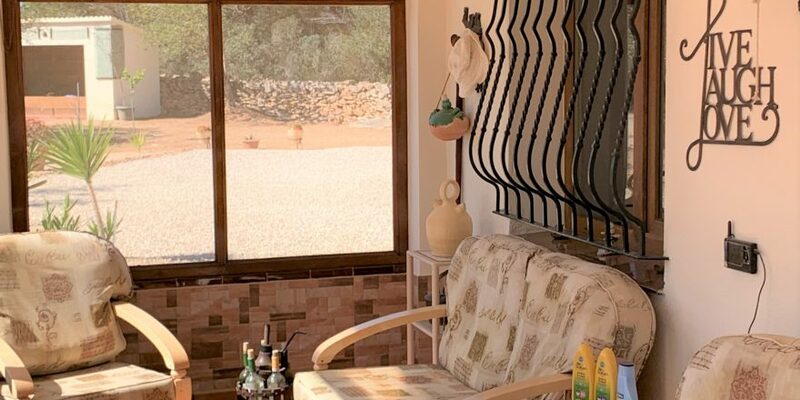 All windows are double glazed, wood effect upvc ´tilt and turn´and have mosquiteras and rejas for security. 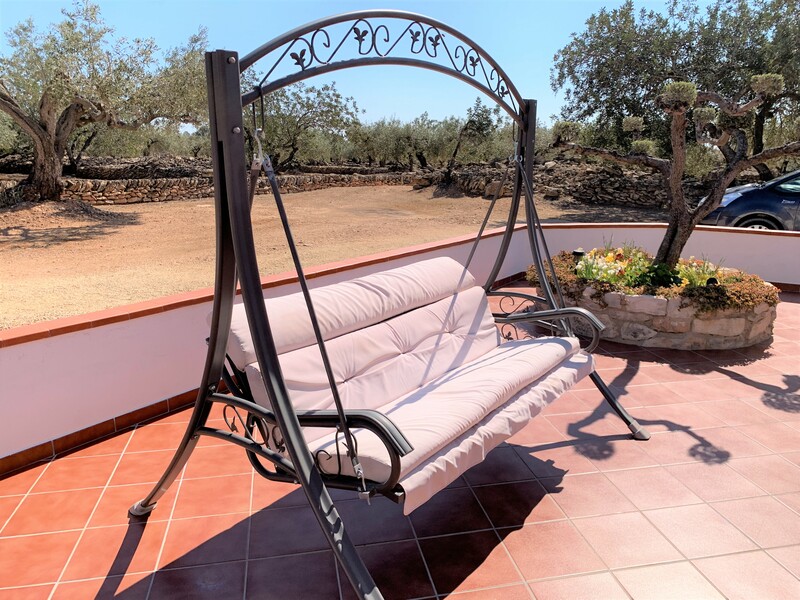 A metal archway leads onto a huge patio which extends around 2 sides of the house. 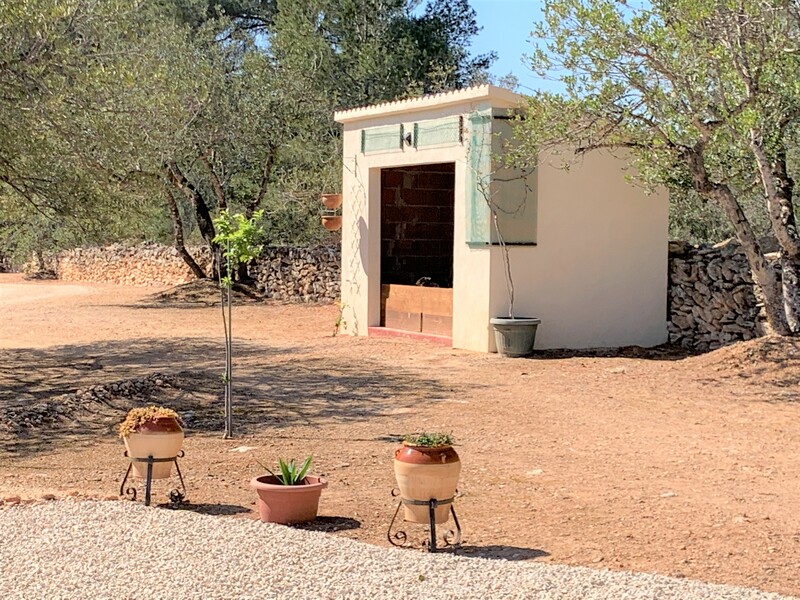 From this you enter into a lovely covered terrace with mosquiteras making it a lovely ´fly free zone´for dining or evenings with a glass of wine. 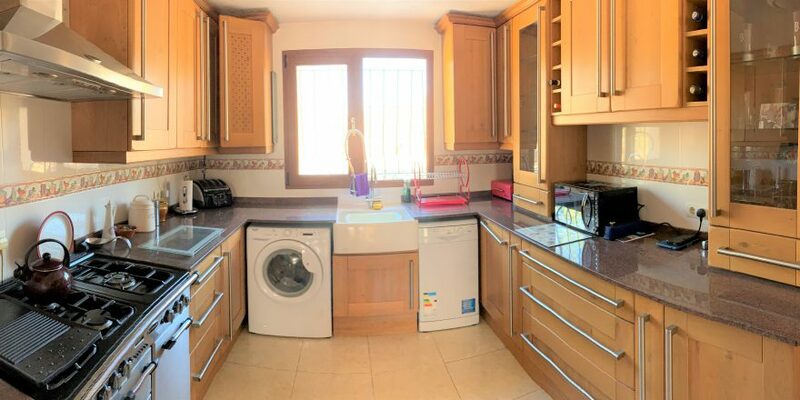 The front door opens into an bright open plan lounge and dining room and kitchen. 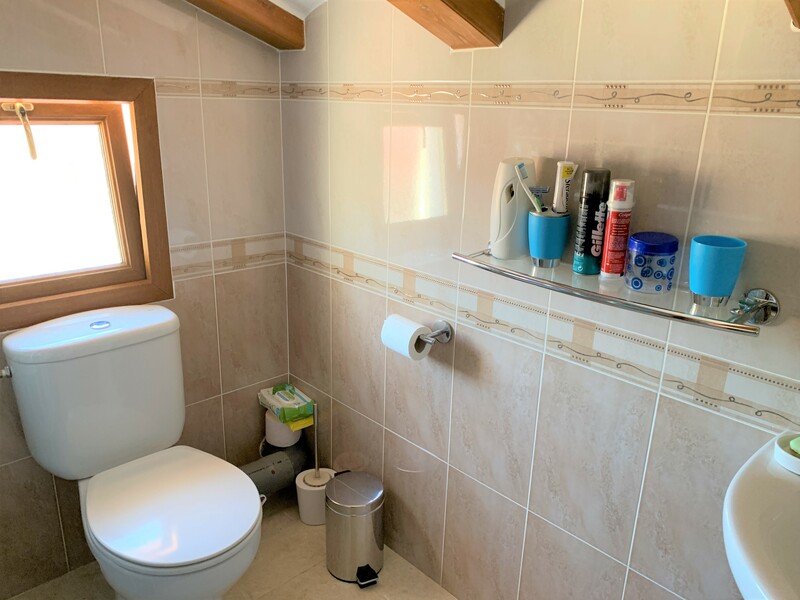 There is a cloakroom with wc and handbasin just on the right as you enter. 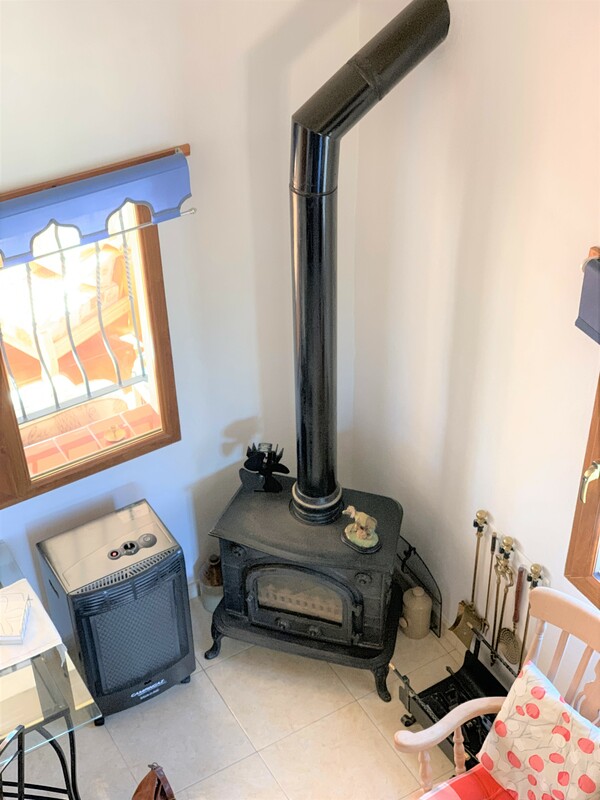 A very large cast iron wood burner easily provides heat to these rooms and also the bedroom upstairs. 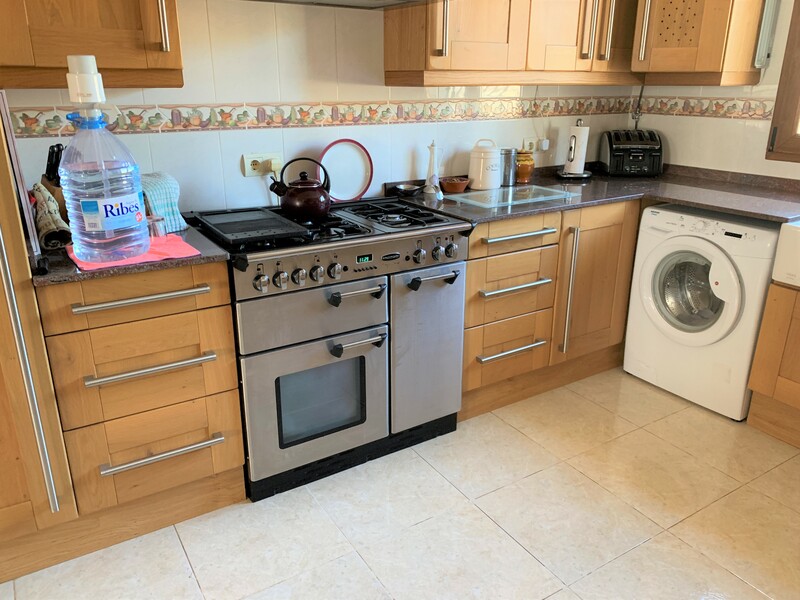 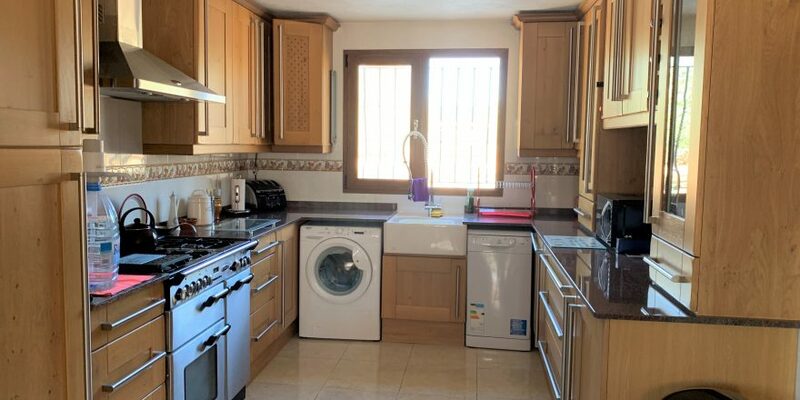 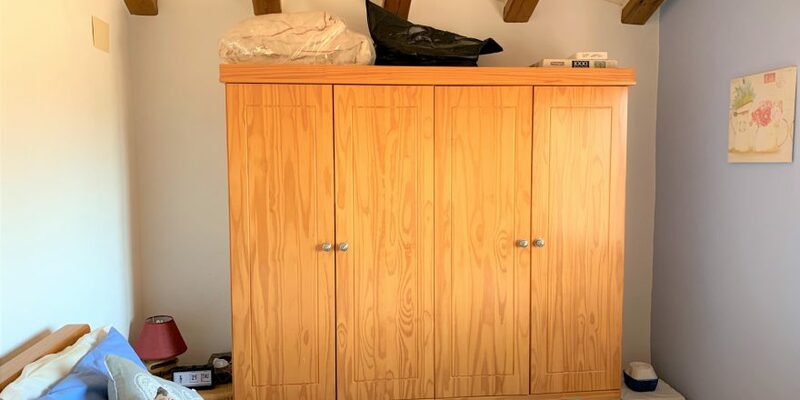 The kitchen units are all fitted and made from real hardwood – not something you see in Spain usually! 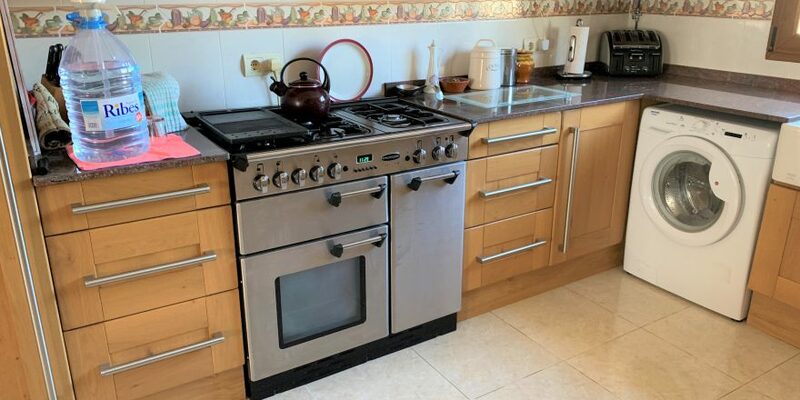 The gas oven and hob are also of better quality than the ´norm´ here! 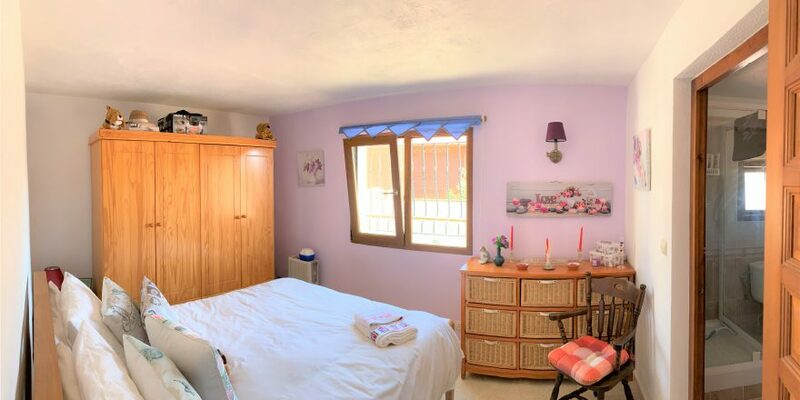 Leading off this open plan area is a door to a guest double bedroom with shower en suite. 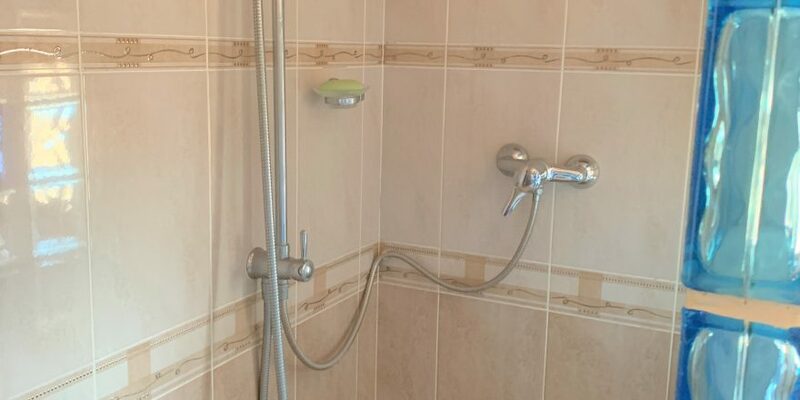 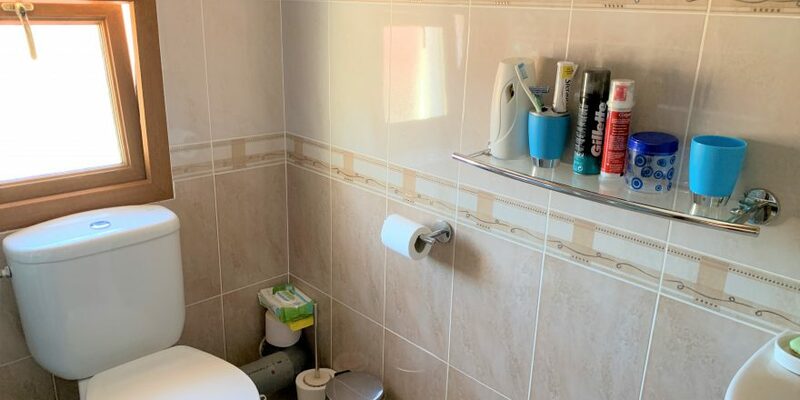 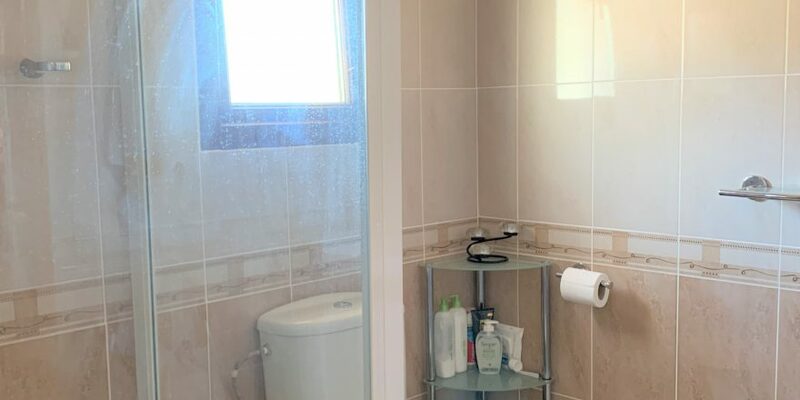 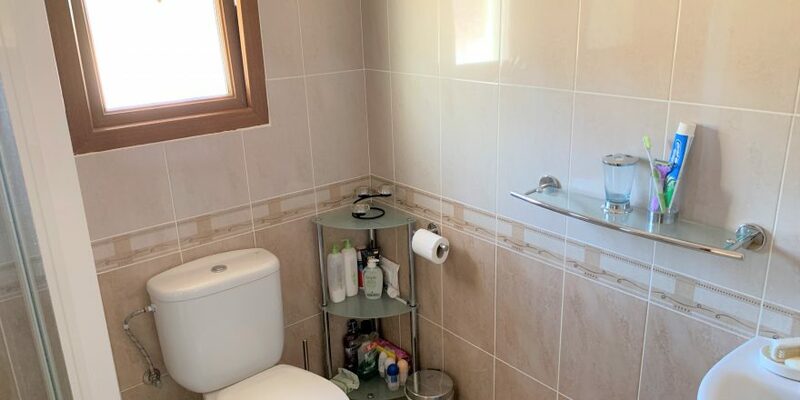 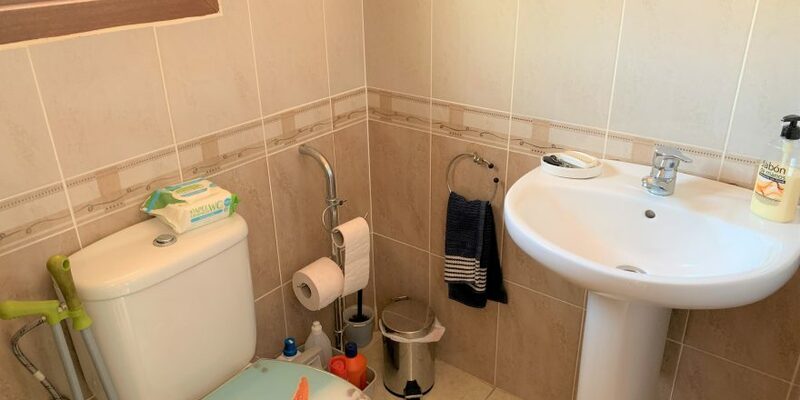 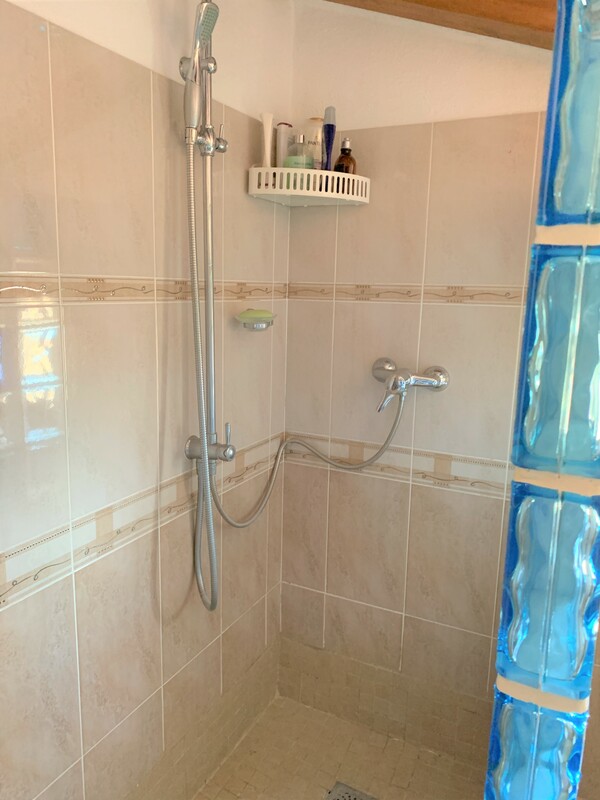 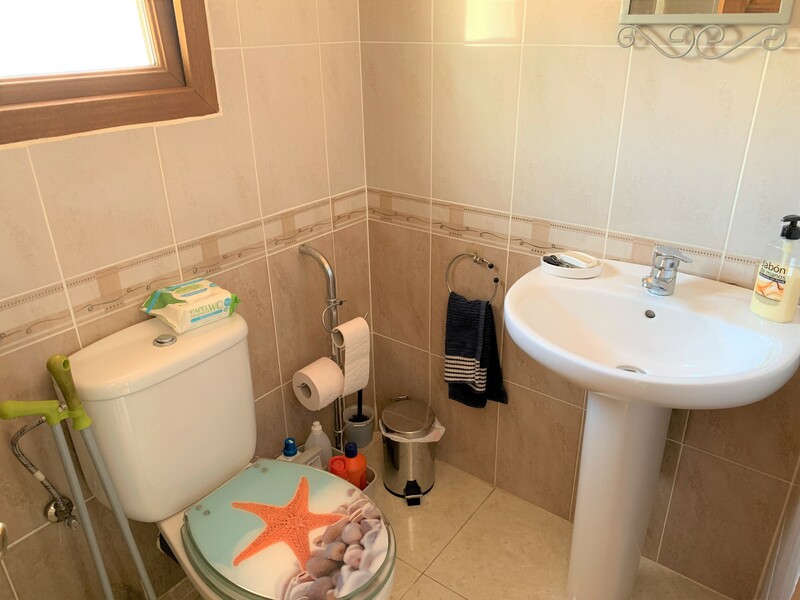 The bedroom and bathroom are of very good size. 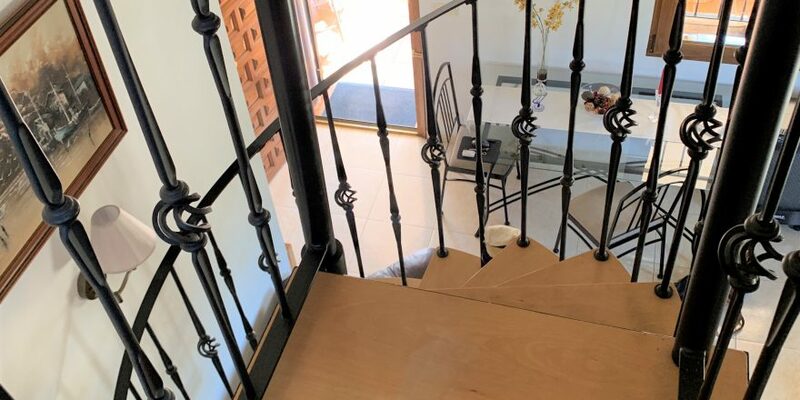 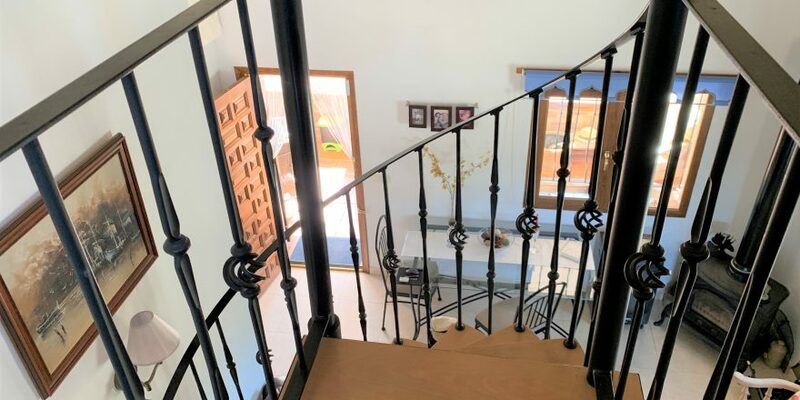 A spiral staircase leads you onto a cosy mezzanine lounge area which has windows on 2 sides to enjoy the views of the surrounding countryside and mountains to the back. 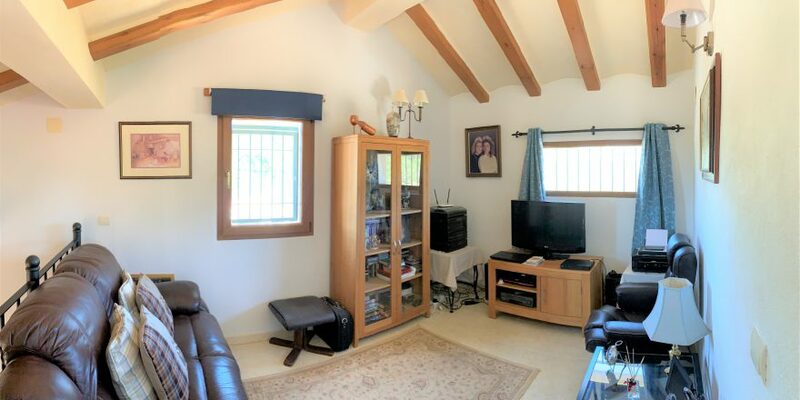 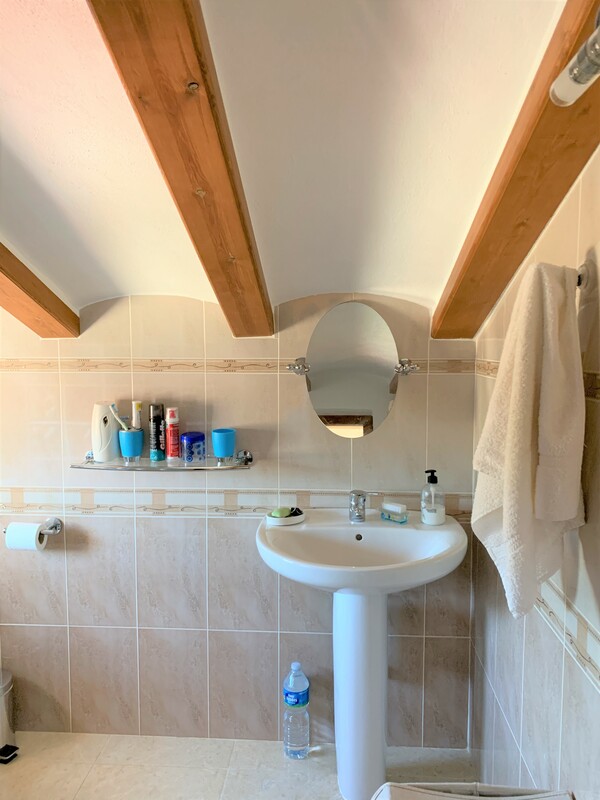 From this level you can appreciate the wooden beams which cover the whole of the ceiling. 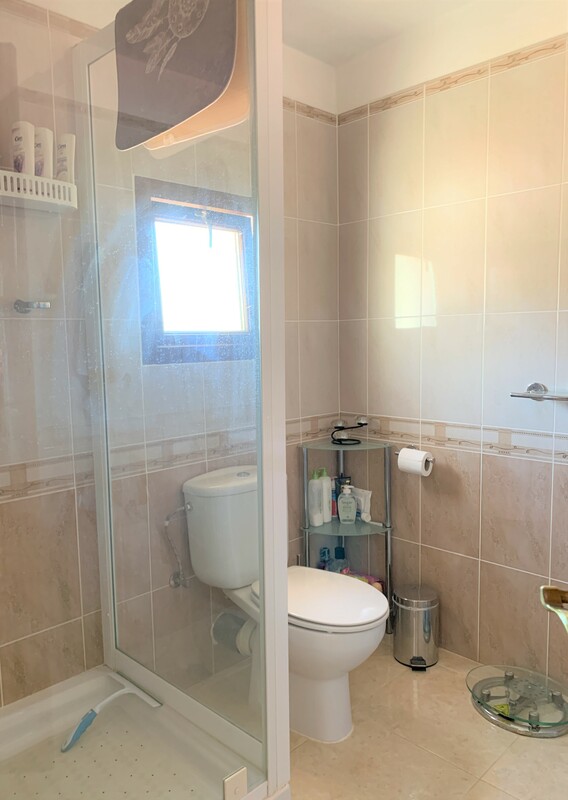 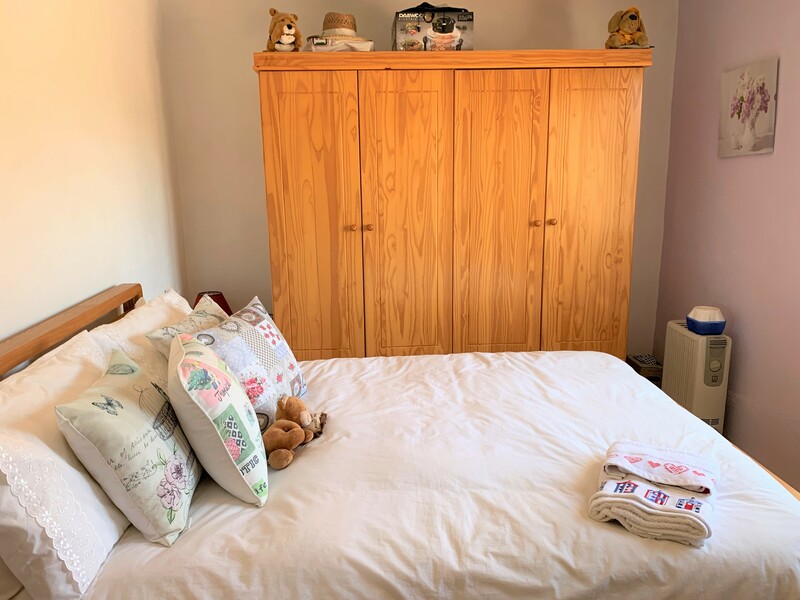 A door off this leads to a very good sized master bedroom and en suite shower room which makes excellent use of the space. 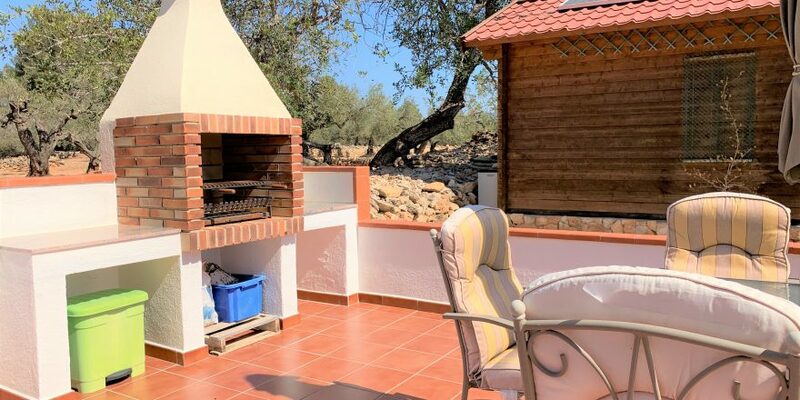 Around the house on the patio there is a lovely bbq area with a brick built bbq and lots of room for dining chairs and garden furniture. 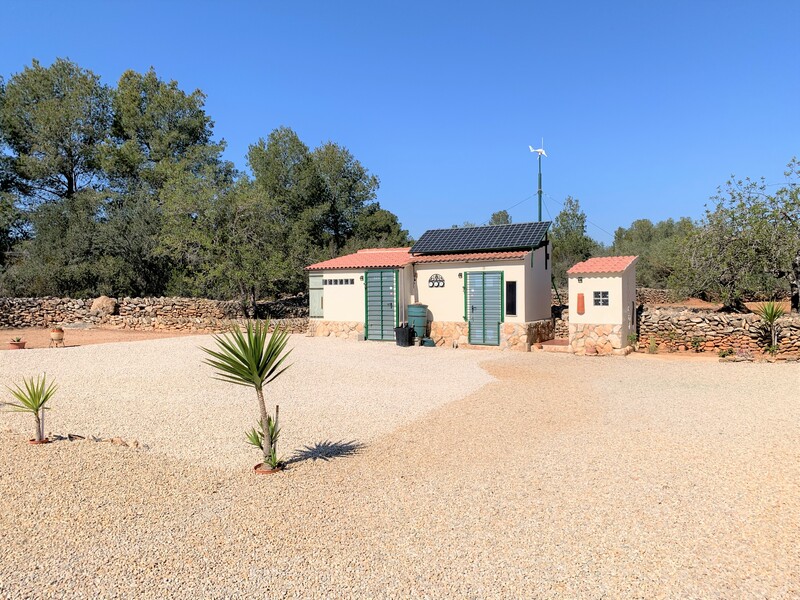 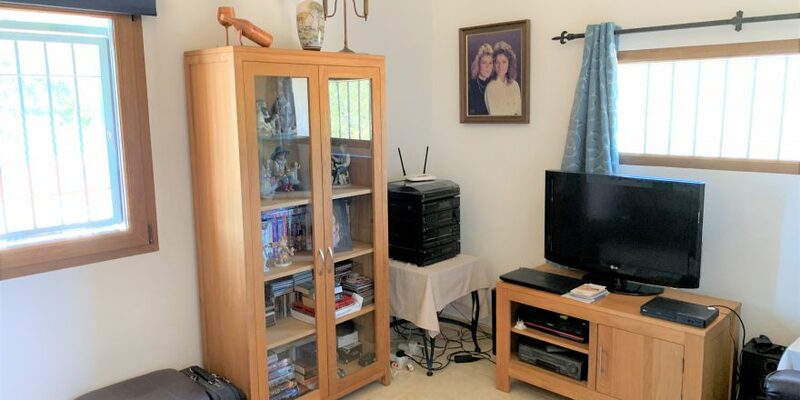 The house is supplied by a 24v solar system – backed up with a very up to date and more than adequate 10kva diesel generator . 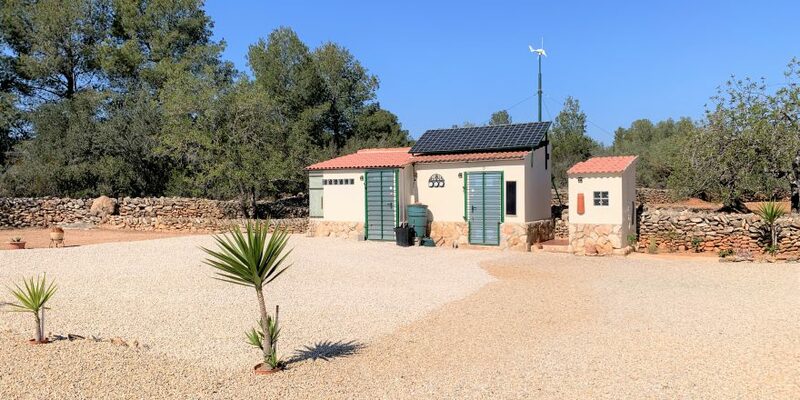 There is also a wind turbine for those (rare) cloudy days! 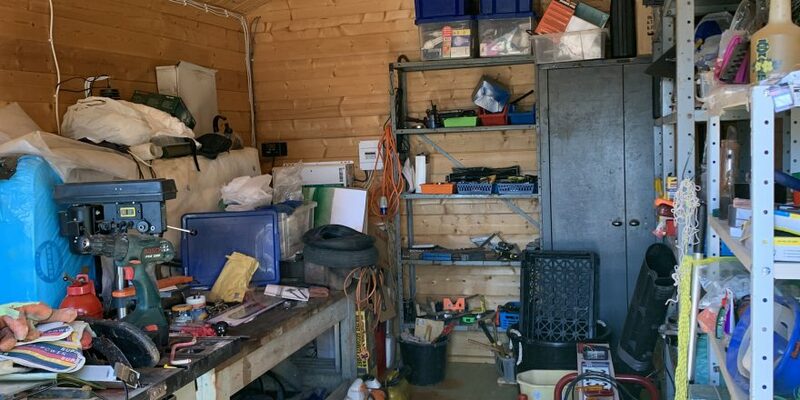 The generator shed houses the generator and the solar batteries and adjacent to this is another shed for general storage. 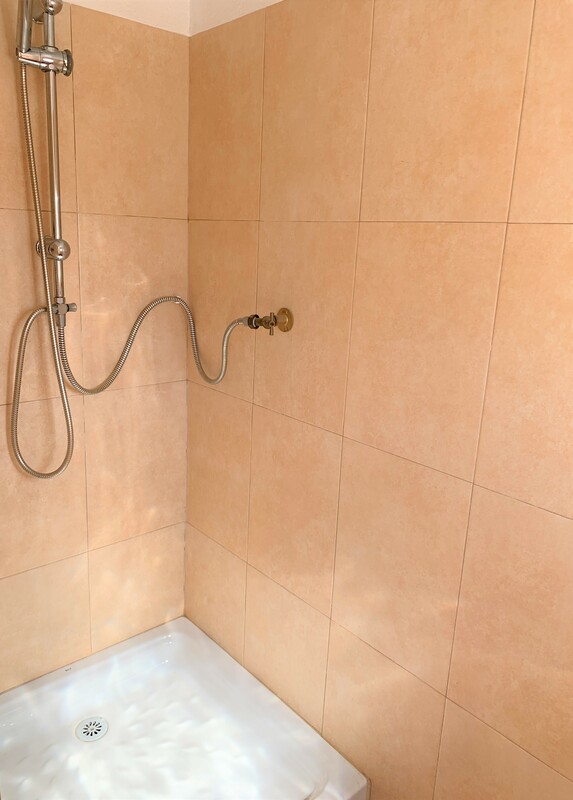 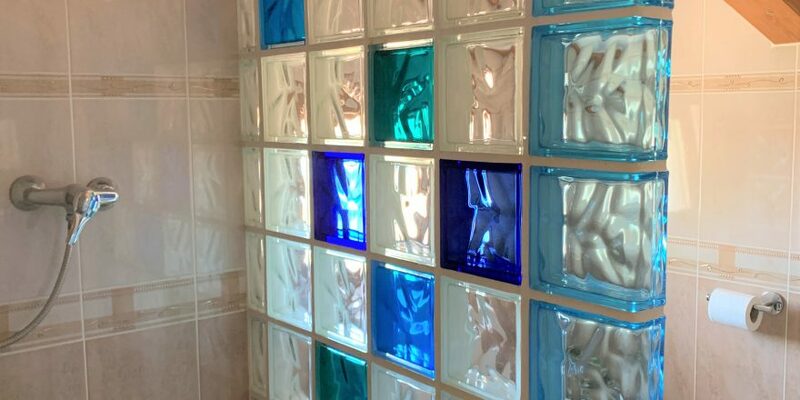 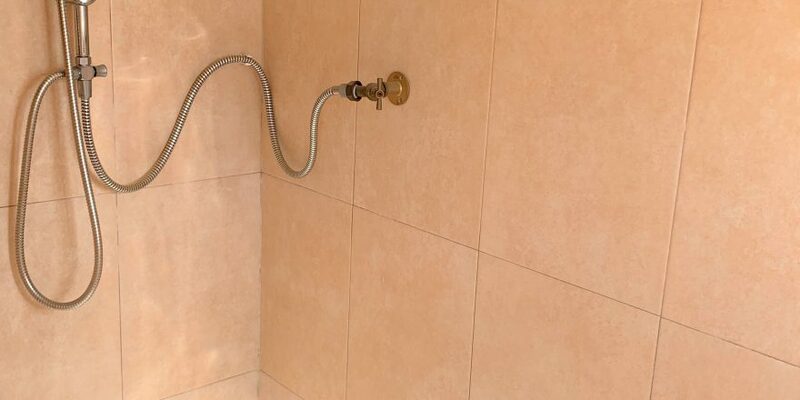 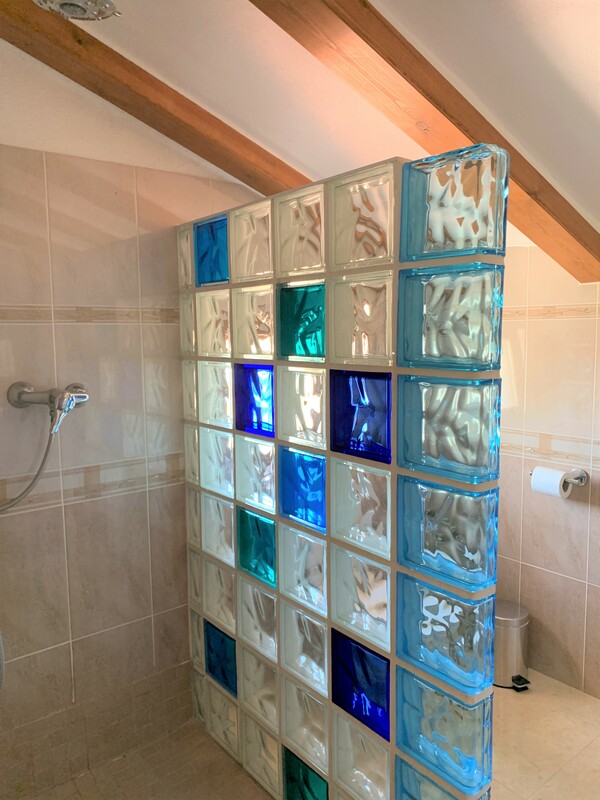 Also next to this is a very well thought out outside shower in it´s own little building. 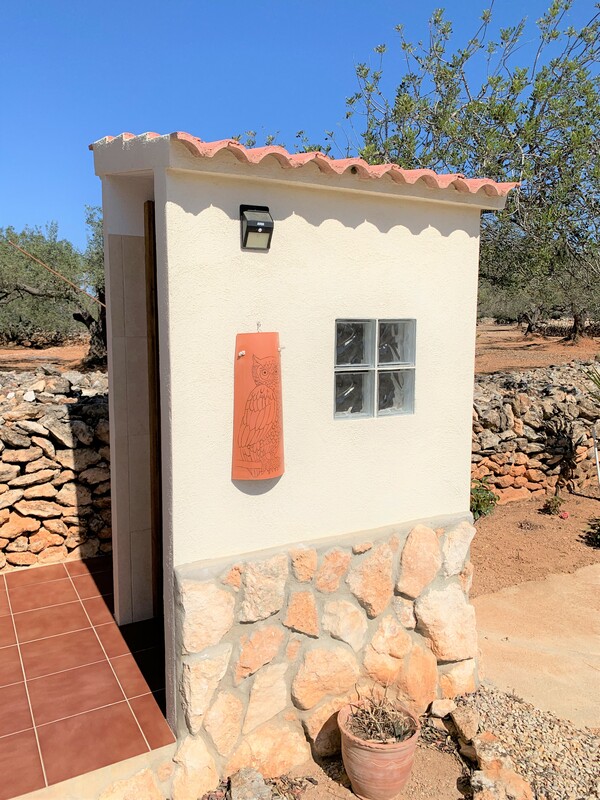 There is a 24.000 litre cisterna for water which can be collected off the roof or bought in to top up. 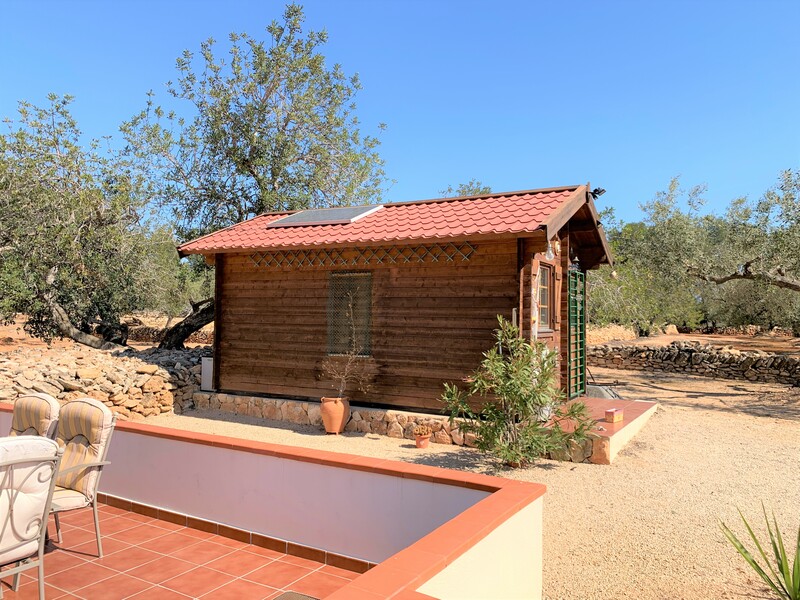 Outside there is also a very generous wooden chalet with it´s own independent solar power system. 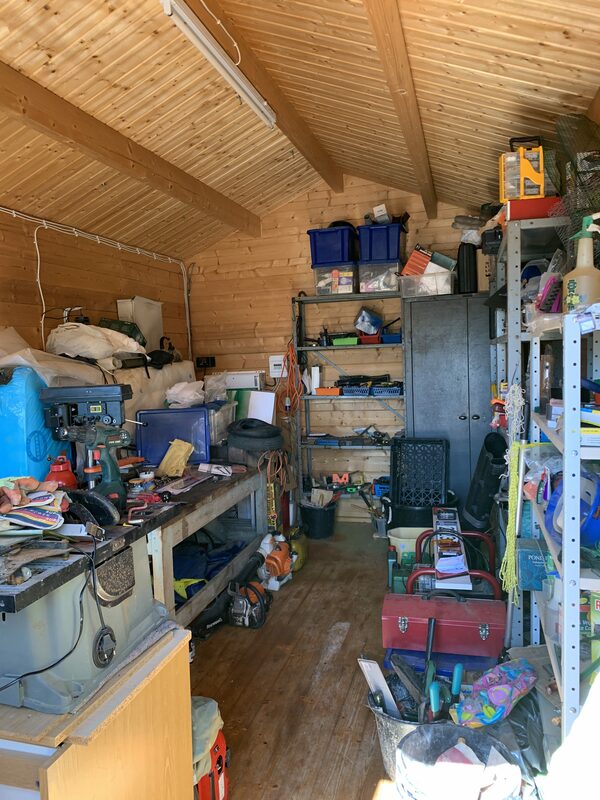 It is currently being used as a workshop but could just as easily be converted into comfortable extra guest accommodation. 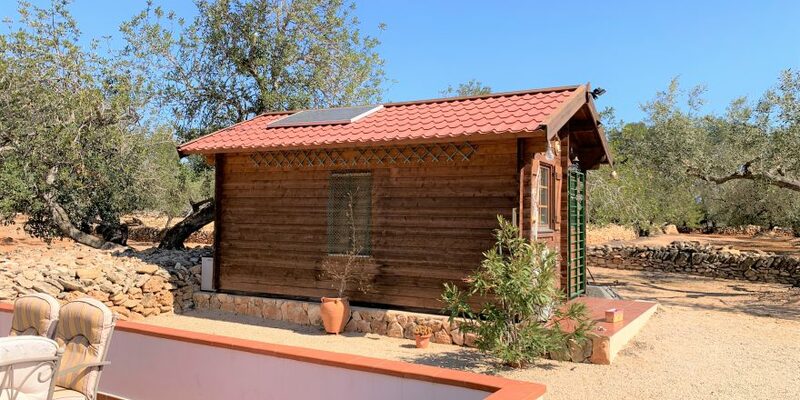 A large log store finishes off the outside built structures. 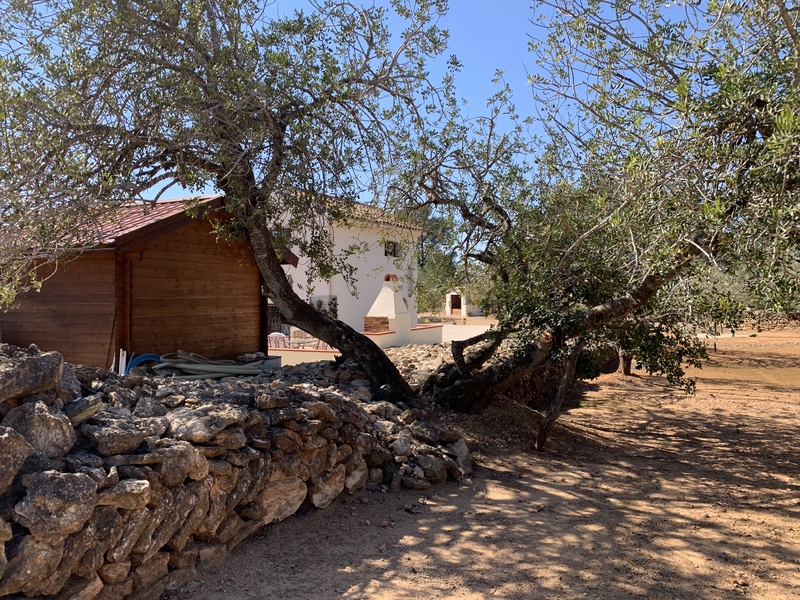 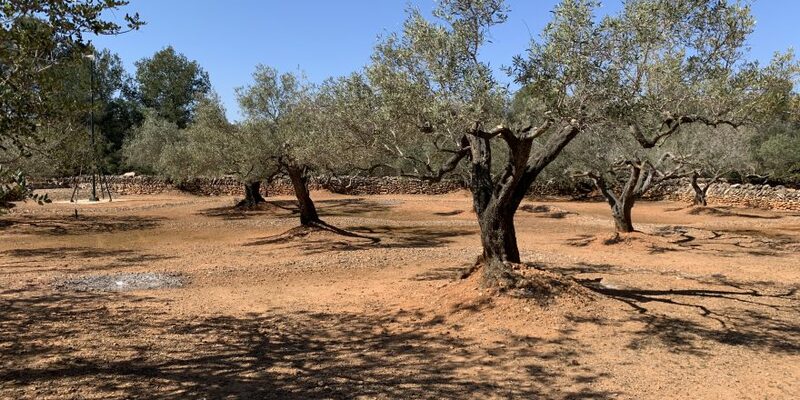 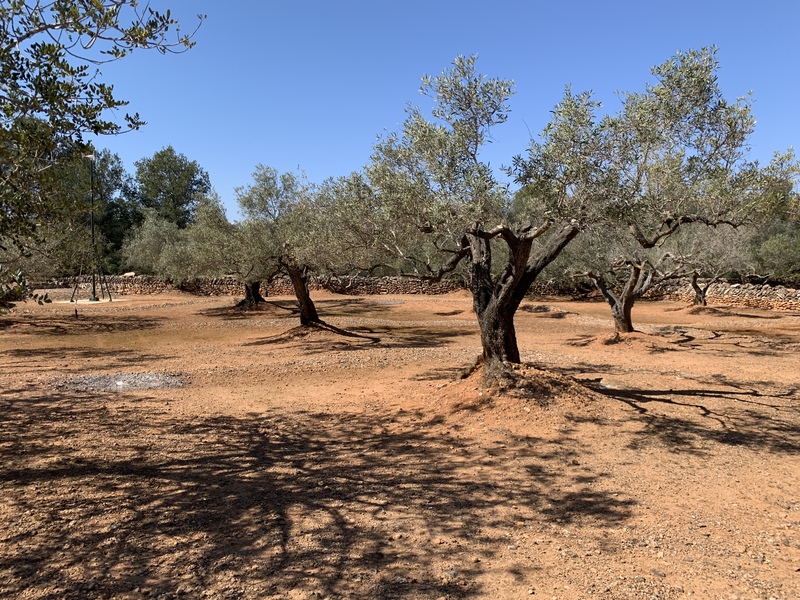 The house is surrounded by 1 hectare of land – which has around 75 well tended olive trees and about 75 also well tended carob trees. 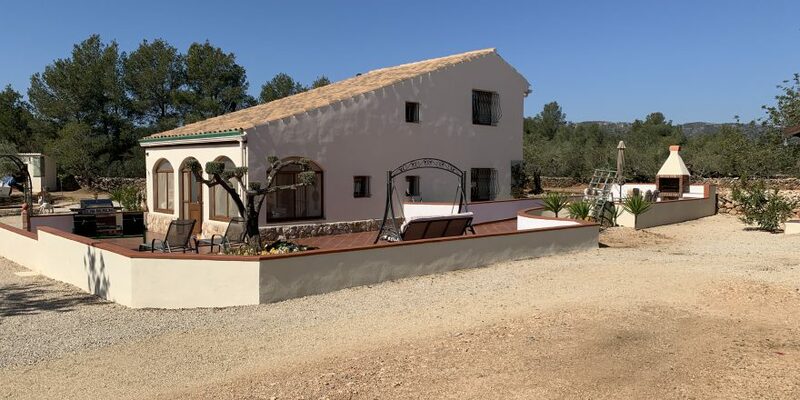 This house is ready to move into – not even a ´small job´to finish off! 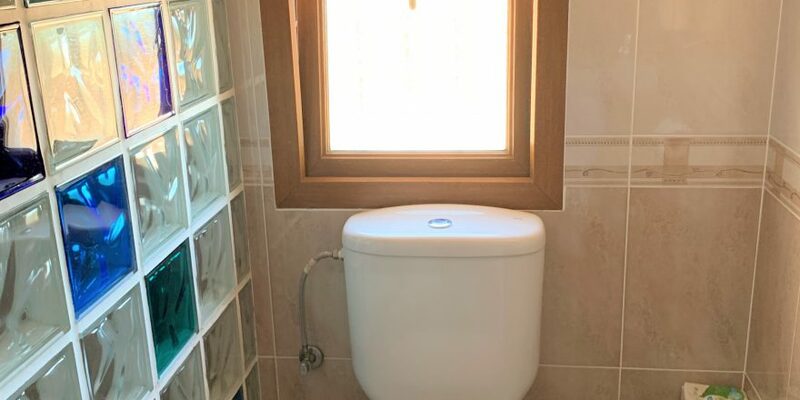 Everything has been done already. 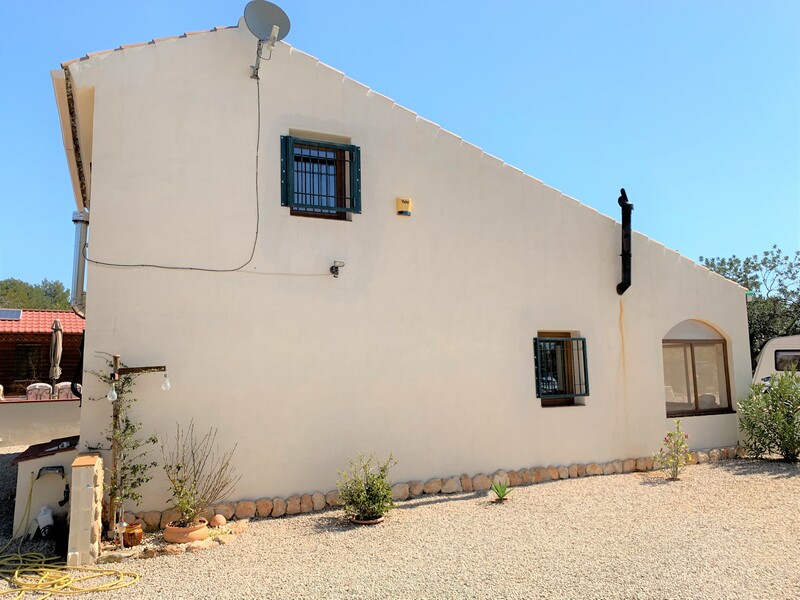 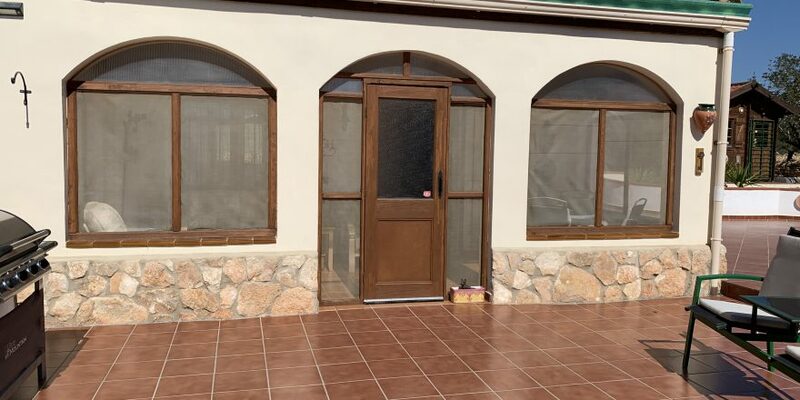 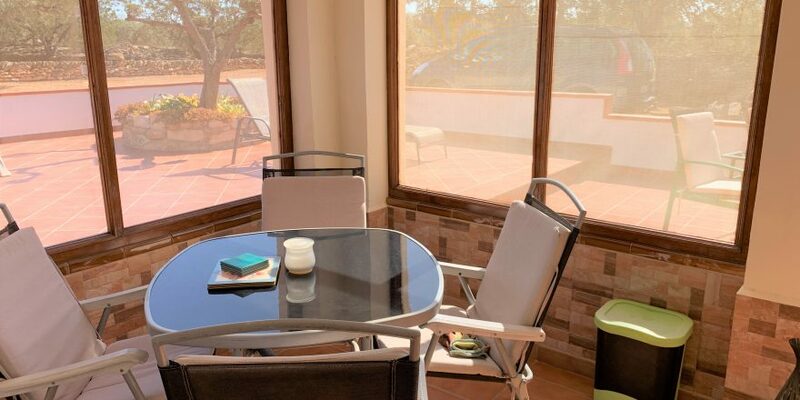 Priced at only €165.000 – partly furnished – ready to move into. 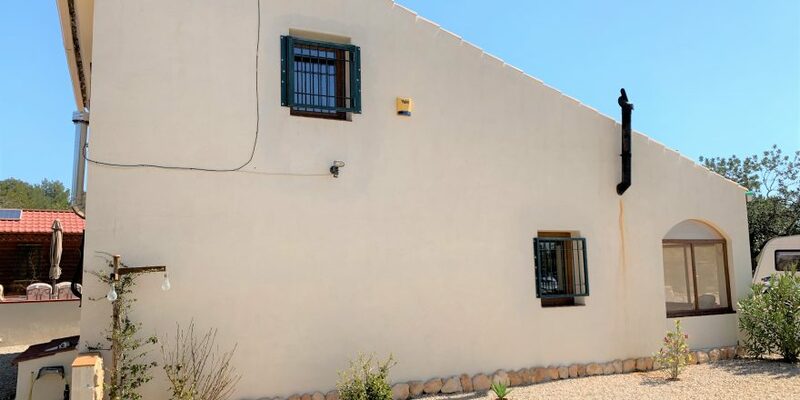 This is another one of our exclusive properties so contact us now to arrange a viewing.